On 5 April OVDAS-SERNAGEOMIN reported that seismicity at Copahue increased during 1-31 March, characterized by abundant volcano-tectonic earthquakes and increases in long-period and very-long-period earthquakes. In addition, the level of the lake water in El Agrio crater had dropped compared to previous months. The Alert Level was raised to Yellow (second highest level on a four-color scale); SERNAGEOMIN recommended no entry into a restricted area within 500 m of the crater. ONEMI raised the Alert Level to Yellow (the middle level on a three-color scale) for the municipality of Alto Biobío. The most recent activity from Copahue originates in the El Agrio crater, which has permanent fumarolic activity and an acidic lake. During 2017, ash emissions began in early June, but decreased after July, although tremor and degassing with occasional ash continued for the remainder of the year (BGVN 43:01). The volcano is monitored by the Servicio Nacional de Geología y Minería (SERNAGEOMIN). This report discusses activity during January-June 2018. According to the Oficina Nacional de Emergencia-Ministerio del Interior (ONEMI), SERNAGEOMIN reported that a hydrothermal explosion was recorded on 24 March 2018, along with increased tremor. The Alert Level was raised to Yellow (second highest level on a four-color scale); SERNAGEOMIN recommended no entry into a restricted area within 1 km of the crater. ONEMI maintained its own Alert Level of Yellow (the middle level on a three-color scale) for the municipality of Alto Biobío (25 km SW). Based on SERNAGEOMIN information, ONEMI reported that during 1-31 March 2018 there were 83 volcano-tectonic events recorded and 204 earthquakes indicting fluid movement. Tremor levels increased on 24 March, the same day as a phreatic explosion, though by the next day it had decreased to baseline levels. Webcams recorded gas plumes rising from El Agrio crater as high as 1 km. During an overflight on 3 April, scientists observed continuous white gas plumes rising almost 400 m.
The Buenos Aires Volcanic Ash Advisory Center (VAAC) reported that on 24 June diffuse steam emissions possibly containing ash were visible in webcam views rising to an altitude of 3.6 km. Information Contacts: Oficina Nacional de Emergencia - Ministerio del Interior (ONEMI), Beaucheff 1637/1671, Santiago, Chile (URL: http://www.onemi.cl/); Servicio Nacional de Geología y Minería (SERNAGEOMIN), Observatorio Volcanológico de Los Andes del Sur (OVDAS), Avda Sta María No. 0104, Santiago, Chile (URL: http://www.sernageomin.cl/); Buenos Aires Volcanic Ash Advisory Center (VAAC), Servicio Meteorológico Nacional-Fuerza Aérea Argentina, 25 de mayo 658, Buenos Aires, Argentina (URL: http://www.smn.gov.ar/vaac/buenosaires/inicio.php). On 6 February OVDAS-SERNAGEOMIN lowered the Alert Level for Copahue to Green, the lowest level on a four-color scale, noting the return of the crater lake and infrequent surficial activity. In addition, data from the geodetic monitoring network showed only slight deformation during the previous three months. ONEMI lowered the Alert Level to Green (the lowest level on a three-color scale) for the municipality of Alto Biobío. The Buenos Aires VAAC reported that on 6 December a pilot observed ash from Copahue at an altitude of 3 km (10,000 ft) a.s.l. Ash was not visible in satellite data and could not be confirmed by unavailable webcams. An ash emission observed by a pilot and identified in satellite images on 7 December rose to 3 km (10,000 ft) a.s.l. and drifted SW. The Buenos Aires VAAC reported that on 2 December a narrow ash plume from Copahue was visible in satellite images drifting ESE. The Buenos Aires VAAC reported that during 14-15 August diffuse steam emissions with possible ash were visible in webcam views rising to an altitude of 3.6 km (12,000 ft) a.s.l. According to ONEMI, OVDAS-SERNAGEOMIN reported that during 16-31 July there were 107 volcano-tectonic events recorded at Copahue, and 266 earthquakes indicating fluid movement. Webcams recorded gas-and-ash plumes rising from El Agrio crater as high as 1.5 km and nighttime incandescence. The Alert Level remained at Yellow (second highest level on a four-color scale); SERNAGEOMIN recommended no entry into a restricted area within 1 km of the crater. ONEMI maintained an Alert Level Yellow (the middle level on a three-color scale) for the municipality of Alto Biobío. The Buenos Aires VAAC reported that on 24 June diffuse steam emissions with possible ash were visible in webcam views rising to an altitude of 3.6 km (12,000 ft) a.s.l. According to ONEMI, OVDAS-SERNAGEOMIN reported that a hydrothermal explosion at Copahue was recorded on 24 March, along with increased tremor. The Alert Level was raised to Yellow (second highest level on a four-color scale); SERNAGEOMIN recommended no entry into a restricted area within 1 km of the crater. ONEMI maintained an Alert Level Yellow (the middle level on a three-color scale) for the municipality of Alto Biobío. Based on satellite and webcam views, the Buenos Aires VAAC reported that during 21 and 24-27 November thin and diffuse steam plumes containing minor amounts of ash rose from Copahue and drifted E and NE. The plumes rose to altitudes of 3.3-3.6 km (11,000-12,000 ft) a.s.l. during 25-26 November. According to ONEMI, OVDAS-SERNAGEOMIN reported that during 16-31 July surficial activity at Copahue had decreased. The webcam recorded constant gas emissions with sporadic ash rising no more than 280 m from El Agrio crater. Crater incandescence was visible during favorable weather conditions. The Alert Level remained at Yellow (second highest level on a four-color scale); SERNAGEOMIN recommended no entry into a restricted area within 1 km of the crater. ONEMI maintained an Alert Level Yellow (the middle level on a three-color scale) for the municipality of Alto Biobío. Based on webcam and satellite images the Buenos Aires VAAC reported that during 16-17 July steam-and-ash plumes rose from Copahue to altitudes of 3-3.4 km (10,000-11,000 ft) a.s.l. and drifted N and NW. Based on webcam and satellite images the Buenos Aires VAAC reported that during 7-8 July steam plumes with minor amounts of ash rose from Copahue to altitudes of 4-4.3 km (13,000-14,000 ft) a.s.l. and drifted ESE. OVDAS-SERNAGEOMIN reported that during 5-15 June the seismic network at Copahue detected long-period earthquakes. Gas plumes constantly rose from El Agrio crater and on several days contained ash. The highest plume, detected on 5 June, rose 300 m and drifted E. The Buenos Aires VAAC reported that on 1 July the webcam recorded a steam-and-gas plume with minor ash near the summit. The Alert Level remained at Yellow (the second lowest on a four-color scale); SERNAGEOMIN recommended no entry into a restricted area within 1 km of the crater. OVDAS-SERNAGEOMIN reported that webcams recorded an increase in ash emissions at Copahue on 4 June. There were no significant changes in the magnitude or number of earthquakes recorded by the seismic network. The report noted that due to inclement weather making visual observations difficult, the observatory did not know if the ash emission began in the early hours of 4 June, or the day before. The Alert Level was raised to Yellow (the second lowest on a four-color scale); SERNAGEOMIN recommended no entry into a restricted area within 1 km of the crater. Based on satellite and webcam images, the Buenos Aires VAAC reported that during 28-30 December continuous gas-and-ash emissions from Copahue rose to altitudes of 3.6-3.9 km (12,000-13,000 ft) a.s.l. and drifted S, SSE, ESE, and E.
Based on satellite and webcam images, the Buenos Aires VAAC reported that during 21-23 December gas-and-ash plumes from Copahue rose to altitudes of 3.6-3.9 km (12,000-13,000 ft) a.s.l. and drifted SE and ESE. According to ONEMI, OVDAS-SERNAGEOMIN reported that during the first two weeks of December activity at Copahue continued to be dominated by weak Strombolian explosions, likely from a pyroclastic cone forming on the floor of El Agrio crater. The Alert Level remained at Yellow (second highest level on a four-color scale); SERNAGEOMIN recommended no entry into a restricted area within 1.5 km of the crater. ONEMI maintained an Alert Level Yellow (the middle level on a three-color scale) for the municipality of Alto Biobío. Based on satellite and webcam images, the Buenos Aires VAAC reported that during 13-20 December gas-and-ash plumes from Copahue rose to altitudes of 3-3.9 km (10,000-13,000 ft) a.s.l. and drifted NE, ENE, E, and SE. Based on satellite and webcam images, the Buenos Aires VAAC reported that during 7-9 and 11 December diffuse gas, water vapor, and ash plumes from Copahue rose to altitudes of 3-3.3 km (10,000-11,000 ft) a.s.l. and drifted NE, E, ESE, and SW. Inclement weather mostly prevented observations on 10 December. Based on satellite and webcam images, the Buenos Aires VAAC reported that during 30 November-4 December and on 6 December diffuse gas, water vapor, and ash plumes from Copahue rose to altitudes of 3.3-4.2 km (11,000-14,000 ft) a.s.l. and drifted S, SE, and E.
On 2 December OVDAS-SERNAGEOMIN reported that activity at Copahue continued to be dominated by weak Strombolian explosions likely from a pyroclastic cone forming on the floor of El Agrio crater. The Alert Level remained at Yellow (second highest level on a four-color scale); SERNAGEOMIN recommended no entry into a restricted area within 1.5 km of the crater. ONEMI maintained an Alert Level Yellow (the middle level on a three-color scale) for the municipality of Alto Biobío. Based on satellite and webcam images, the Buenos Aires VAAC reported that during 23-25 and 27-29 November diffuse steam-and-ash plumes rose from Copahue to altitudes of 3.3-5.2 km (11,000-17,000 ft) a.s.l. and drifted SW, SE, and N. The Alert Level remained at Yellow; SERNAGEOMIN recommended no entry into a restricted area within 1.5 km of the crater. Based on satellite and webcam images, the Buenos Aires VAAC reported that during 16-18 and 21-22 November diffuse steam-and-ash plumes rose from Copahue to altitudes of 3.3-3.6 km (11,000-12,000 ft) a.s.l. and drifted NE, ENE, E, and WNW. On 17 November OVDAS-SERNAGEOMIN reported that activity continued to be dominated by weak Strombolian explosions likely from a pyroclastic cone forming on the floor of El Agrio crater. The Alert Level remained at Yellow; SERNAGEOMIN recommended no entry into a restricted area within 1.5 km of the crater. Based on satellite and webcam images, the Buenos Aires VAAC reported that during 9-12 November gas, steam, and ash plumes rose from Copahue to altitudes of 3.3-3.6 km (11,000-12,000 ft) a.s.l. and drifted SE, E, and NE. Based on satellite and webcam images, the Buenos Aires VAAC reported that during 4-5 and 7-8 November gas and water vapor plumes with minor ash content rose from Copahue to altitudes of 3.3-3.9 km (11,000-13,000 ft) a.s.l. and drifted E and NE. Based on satellite and webcam images, the Buenos Aires VAAC reported that during 27-30 October gas and water vapor plumes with minor ash content remained near Copahue's summit. The plumes drifted NE on 27 October and E on 30 October. The Buenos Aires VAAC reported that on 23 September the webcam at Copahue recorded steam-and-gas emissions possibly containing minor amounts of ash. OVDAS- SERNAGEOMIN reported that during 16-30 June the eruption at Copahue was characterized by phreato-magmatic explosions and Strombolian activity. On 4 July, SERNAGEOMIN posted on their social media page photos from an overflight showing Strombolian activity from a crater atop of a pyroclastic cone which was forming on the floor of El Agrio crater. Based on webcam and satellite views, the Buenos Aires VAAC reported that during 7-8 July diffuse gas-and-steam plumes with minor amounts of ash rose to an altitude of 3 km (10,000 ft) a.s.l. and drifted E and SE. The Alert Level remained at Yellow; SERNAGEOMIN recommended no entry into a restricted area within 1.5 km of the crater. The Buenos Aires VAAC reported that on 11 June the webcam at Copahue recorded steam-and-gas emissions possibly containing minor amounts of ash. The Buenos Aires VAAC reported that during 23-26 March webcam and satellite images detected steam-and-ash emissions rising above Copahue’s crater to altitudes of 3-3.3 km (10,000-11,000 ft) a.s.l. and drifting NE, SE, and S.
The Buenos Aires VAAC reported that during 11 and 13-16 March webcam and satellite images detected steam-and-ash emissions rising above Copahue’s crater to altitudes of 3.3-3.7 km (11,000-12,000 ft) a.s.l. and dissipating near the summit. The Buenos Aires VAAC reported that during 5-7 March a webcam recorded minor stream-and-gas emissions near Copahue’s crater; on 7 March the emissions drifted SE and ESE at altitudes of 3-3.7 km (10,000-12,000 ft) a.s.l. Based on satellite and webcam views, the Buenos Aires VAAC reported that during 24-25 and 28 February steam plumes containing minor amounts of ash rose from Copahue and drifted E at altitudes of 3.3-4.3 km (11,000-14,000 ft) a.s.l. Based on satellite and webcam views, the Buenos Aires VAAC reported that on 17 and 20 February steam plumes containing minor amounts of ash rose from Copahue and drifted SE at an altitude of 3.3 km (11,000 ft) a.s.l. Only gas emissions were visible on 19 February. Based on satellite and webcam views, the Buenos Aires VAAC reported that during 10-16 February Copahue generated almost continuous steam plumes containing minor amounts of ash that rose to altitudes of 3-3.6 km (10,000-12,000 ft) a.s.l. and drifted NE, E, SE, S, and SW.
Based on satellite and webcam views, the Buenos Aires VAAC reported that during 3-9 February Copahue generated almost continuous steam plumes containing minor amounts of ash that rose to altitudes of 3-3.6 km (10,000-12,000 ft) a.s.l. and drifted as far as 150 km ENE, ESE, SE, and S.
Based on satellite and webcam views, the Buenos Aires VAAC reported that during 28 January-2 February Copahue generated almost continuous steam plumes containing minor amounts of ash that rose to altitudes of 3-3.6 km (10,000-12,000 ft) a.s.l. and drifted as far as 160 km SE and SW.
Based on satellite and webcam views, the Buenos Aires VAAC reported that during 20-23 January almost continuous steam plumes from Copahue contained minor amounts of ash and drifted as far as 150 km W, S, SE, and E.
Based on a SIGMET and webcam views, the Buenos Aires VAAC reported that on 13 and 16 January continuous gas-and-steam plumes from Copahue contained minor amounts of ash and drifted SE. Based on satellite and webcam views, the Buenos Aires VAAC reported that on 6 January a gas and steam plume from Copahue with minor amounts of ash rose to an altitude of 4.6 km (15,000 ft) a.s.l. Based on satellite and webcam views, the Buenos Aires VAAC reported that on 30 December diffuse gas and steam plumes possibly containing ash drifted SSE. The next day ash emissions drifted SW.
Based on satellite and webcam views, the Buenos Aires VAAC reported that during 24-25, 27, and 29 December diffuse ash plumes from Copahue rose to altitudes of 3-3.6 km (10,000-12,000 ft) a.s.l. and drifted SE. Based on satellite and webcam views, the Buenos Aires VAAC reported that during 18-20 December steam and gas emissions with minor amounts of ash rose to altitudes of 3-3.6 km (10,000-12,000 ft) a.s.l. Plumes drifted N on 18 December and 55-150 km SSE and SE on 19 December. During 20-22 December the webcam recorded continuous ash emissions drifting short distances. SERNAGEOMIN reported that during 16-30 November continuous ash emissions from explosions at Copahue's El Agrio crater were recorded by the webcam; plumes rose as high as 1.3 km above the crater on 29 November. Satellite images detected ash plumes drifting as far as 560 km SE and ESE. During an overflight on 28 November scientists observed the absence of the acidic lake and a growing pyroclastic cone. Impact craters from ballistics ejected during minor explosions were within a radius of 300 m of El Agrio. Satellite images detected a thermal anomaly during 28-29 November. The Alert Level remained at Yellow; SERNAGEOMIN recommended no entry into a restricted area within 1.5 km of the crater. ONEMI maintained Level Yellow for the community of Alto Biobío (40 km W) in the Biobío region (since 3 June 2013). SERNAGEOMIN reported that at 1930 on 19 November tremor amplitude at Copahue began to oscillate. At 0305 on 20 November crater incandescence was coincident with small explosions that produced ash plumes. The Alert Level remained at Yellow; SERNAGEOMIN recommended no entry into a restricted area within 1.5 km of the crater. ONEMI maintained Level Yellow for the community of Alto Biobío (40 km W) in the Biobío region (since 3 June 2013). Based on webcam images, the Buenos Aires VAAC reported continuous emissions of water vapor and gas with minor amounts of ash on 20 November; ash was not detected in satellite images. According to the Buenos Aires VAAC, the webcam recorded weak emissions of steam, gas, and possibly minor amounts of ash rising from Copahue during 16-18 October. According to the Buenos Aires VAAC, a pilot observed a gray plume rising from Copahue to altitudes of 6.1-7.6 km (20,000-25,000 ft) a.s.l. and drifting NE on 11 October. Satellite images indicated no ash; the webcam recorded continuous emissions of water vapor and gas, and low-levels of ash. The next day the webcam recorded weak steam-and-gas emissions possibly with minor amounts of ash drifting SE. On 6 October SERNAGEOMIN reported that beginning at 0202 observers noted sporadic crater glow at Copahue, indicative of small explosions in Agrio Crater. A grayish plume rose 200 m above the crater and drifted SE. SERNAGEOMIN lowered the Alert Level to Yellow and recommended no entry into a restricted area within 2.5 km of the crater. ONEMI maintained Level Yellow for the community of Alto Biobío (40 km W) in the Biobío region (since 3 June 2013). The Buenos Aires VAAC reported that on 26 November diffuse steam-and-gas emissions from Copahue, recorded by the ODVAS webcam and satellite images, possibly contained a small amount of ash. The plume rose to altitudes of 3.4-3.7 km (11,000-12,000 ft) a.s.l. and drifted 65 km E. On 30 November a pilot observation and webcam views revealed a diffuse and continuous plume near the summit. During 1-2 December a diffuse plume was detected in satellite images while the webcam recorded continuous ash emissions. The Buenos Aires VAAC reported that during 15-16 November diffuse steam-and-gas emissions from Copahue recorded by the ODVAS webcam contained a small amount of ash. On 24 October SERNAGEOMIN reported a continuing downward trend of seismicity at Copahue and that emissions had become more diffuse with only minute amounts of tephra in some plumes. A small mud lake had also formed in the crater. SERNAGEOMIN lowered the Alert Level to Yellow and recommended no entry into a restricted area within 3 km of the crater. ONEMI maintained Level Yellow for Alto Biobío (40 km W) in the Biobío region (since 3 June 2013). SERNAGEOMIN reported that on 15 October gray ash plumes rose 300 m above Copahue’s El Agrio Crater and four explosions were recorded. Plumes on 17 October were generally white and rose 100 m; no explosions were detected. Seismicity was low on 18 October. Plumes on 19 October rose 300 m. Six explosions associated with ash emissions were recorded. Incandescence from the crater was detected in the evening. On 20 October the network recorded 12 explosions with associated ash emissions. During 20-21 October plumes rose 200 m, and crater incandescence at night was noted. SERNAGEOMIN maintained the Alert Level at Orange, and ONEMI maintained Level Yellow for Alto Biobío (40 km W) in the Biobío region (since 3 June 2013). SERNAGEOMIN reported that two explosions from Copahue’s El Agrio Crater occurred at 0752 and 1349 on 11 October, and generated dark gray ash plumes that rose at most 3.6 km above the crater. Some minor explosions were detected after the second explosion. Incandescence in the vicinity of the crater was observed at night. The Alert Level was raised to Orange. Cameras near the volcano recorded dark gray ash plumes rising to a maximum height of 1.9 km and drifting 35 km NE on 12 October, 2.2 km and drifting E on 13 October, and 0.4 km and drifting E on 14 October. Minor explosions continued to be detected. The Buenos Aires VAAC reported that during 6-7 October diffuse steam-and-gas emissions from Copahue detected in satellite images contained a small amount of ash. The webcam showed that the emission source was near the summit. On 26 September a special volcanic activity report issued by OVDAS-SERNAGEOMIN noted a seismic swarm at Copahue; between 1600 and 1900 the seismic network recorded 140 long-period events. Cameras near the volcano recorded increased emissions; mostly white plumes with some ash rose 200-500 m and drifted SE. The report also noted that swarms had been recorded in late July and during 1-16 September. The Alert Level remained at Yellow. On 14 September SERNAGEOMIN reported elevated seismicity from Copahue. A seismic swarm occurred during 1200-1900 comprising 389 LP earthquakes; epicenters were within the crater area and hypocenters were at depths less than 3 km. SERNAGEOMIN noted that this unrest was similar to that from May and October 2013. Web cameras located nearby captured a persistent vapor plume that reached ~250 m above the crater and drifted ~700 m ENE. The Alert Level remained at Yellow. SERNAGEOMIN reported that a phreatic explosion from Copahue occurred at 2023 on 4 July that deposited bombs (less than 12 cm in diameter), lapilli (less than 4 cm), ash, and gray clay smelling strongly of sulfuric acid along the E flank of the crater. During an overflight on 7 July, OVDAS officials observed the deposit and measured a moderate amount of gas emissions (an average of 4,000 tons per day of SO2), a relatively low level of water in the crater, and low temperatures of the fumaroles within El Agrio crater. DOAS stations had measured up to 18,000 tons/day of SO2 on the day of the explosion. An anomalous tremor signal was detected at 0823 on 5 July that was associated with an explosion from El Agrio crater; a microphone installation 13 km E also detected an acoustic signal. The explosion generated a plume 1,000 m above the crater. The Alert Level remained at Yellow. On 4 April OVDAS-SERNAGEOMIN reported that activity at Copahue continued to fluctuate at an elevated level however did not indicate an impending eruption. The Alert Level was lowered to Yellow. OVDAS-SERNAGEOMIN reported that cameras installed around Copahue recorded white gas plumes rising 100-600 m above the crater during 25-29 March; clouds prevented observations on 30 March. Sulfur dioxide measurements in tons per day were 270 on 26 March, 1,400 on 27 March, 2,000 on 28 March, 1,400 on 29 March, and 920 on 30 March. The Alert Level remained at Orange. OVDAS-SERNAGEOMIN reported that a gradual increase of volcanic tremor was detected at Copahue starting at 0230 on 20 March; from 0230 to 1100 the signal fluctuated and intense periods lasted up to 3 hours. Cameras showed minimal activity at the surface while concentrations of sulfur dioxide increased. The Alert Level was raised to Orange. Residents and visitors were prohibited within a 3-km radius of the active crater. During 21-24 March gas plumes rose at most 500 m and drifted E. Seismicity continued to increase. Based on satellite images, the Buenos Aires VAAC reported that on 21 November a 5-km-wide steam plume possibly containing ash extended over 35 km SE of Copahue. A few hours later the webcam recorded a possible ash plume drifting SE at low altitudes. Based on ODVAS webcam views and satellite images, the Buenos Aires VAAC reported that on 15 November a low-level diffuse plume from Copahue drifted almost 40 km NW. Later that night a thermal anomaly was detected by satellite and light from a full moon allowed webcam views of a possible ash emission. The next day steam-and-gas emissions were observed with the webcam. The Alert Level remained at Yellow. OVDAS-SERNAGEOMIN reported that during 16-31 October the webcam installed 18 km SW of Copahue recorded steady fumarolic activity from Del Agrio Crater, which produced plumes that rose 1.8 km above the crater rim. On 28 October the plume changed color, suggesting ash content, and was accompanied by a small explosion recorded at 1252. The Alert Level remained at Yellow. Based on web camera views, the Buenos Aires VAAC reported that on 26 June steam-and-gas emissions from Copahue possibly contained ash. Ash was not detected in clear satellite images. OVDAS-SERNAGEOMIN reported that during 11-12 June seismicity at Copahue had significantly decreased with respect to the previous 24-hour period; the majority of the signals were low-magnitude hybrid events, detected at an average rate of one per hour. White plumes recorded by a web camera rose at most 100 m and drifted E. Seismicity remained low during 12-13 June; an average of one event per hour continued to be detected. Meteorological cloud cover prevented views of the crater. The Alert Level remained at Orange. OVDAS-SERNAGEOMIN reported that during 4-11 June white plumes recorded by a web camera rose at most 200 m above Copahue and drifted N and E. During 4-5 June seismicity had decreased with respect to the previous 24-hour period; the majority of the signals were low-magnitude hybrid events, detected at an average rate of 42 per hour. During 5-6 June seismicity was similar to the previous period, with an average of 50 events per hour being detected. Seismicity increased during 6-7 June; an average of 84 events per hour was detected. During 7-8 June seismicity fluctuated with a high average of 124 events per hour then decreased to a low average of 8 events per hour; the overall average was 62 events per hour. Seismicity decreased during 8-9 June; only 5 events per hour were detected. On 9 June OVDAS-SERNAGEOMIN scientists aboard an overflight to locate sites for the installation of three additional seismic stations observed fumaroles inside Del Agrio Crater, and gas emissions that rose at most 200 m and drifted NE. They noted that no lava dome was present. During 9-10 June the number of earthquakes increased to an average of 20 events per hour. The Alert Level remained at Orange. OVDAS-SERNAGEOMIN reported that during 28-29 May seismicity at Copahue had decreased with respect to the previous 24-hour period; the majority of the signals were low-magnitude hybrid events, detected at an average rate of 127 per hour. Meteorological cloud cover prevented visual observations. During 29-30 May seismicity again decreased; earthquakes were detected at a rate of 40 events per hour. A camera near the volcano recorded a white plume that rose 100-200 m and drifted SE. The seismic network continued to record a downward trend during 30-31 May, with 120 events per hour detected during the night. By the time of the release of the report at 1700 on 31 May about 20 events per hour were being detected. Visual observations were again inhibited due to weather conditions. About 42 events per hour were recorded during 31 May-1 June, about 52 events per hour were detected during 1-2 June, and about 102 events per hour were detected during 2-3 June. A small plume rose 80 m above the crater during 2-3 June. ONEMI reported on 3 June that about 280 people, of 2,440 people, remained within the 25-km evacuation zone. That same day SERNAGEOMIN lowered the Alert Level to Orange. OVDAS-SERNAGEOMIN reported that a gradual increase of seismicity at Copahue had been detected since 15 May. A camera recorded periodic small explosions and corresponding ash emissions, along with nighttime incandescence. On 19 May satellite images detected increased sulfur dioxide emissions, which produced a plume that rose 300 m above the crater and drifted SE. Images from 20 and 22 May showed large plumes drifting 100 km SE that appeared translucent gray, suggesting a significant presence of volcanic gases. On 23 May the Alert Level was raised to Orange. On 24 May cameras recorded white plumes that mostly rose 250-400 m; at 1900 a plume rose 1.9 km, and another drifted NE. Seismicity increased sharply during 24-25 May. The seismic network detected 8,556 low-magnitude earthquakes with an average of 356 events per hour, and a gap of a few seconds between events. Seismicity increased again during 25-26 May, with an average of 455 events per hour, and then decreased to 269 events per hour during 26-27 May. An explosion on 26 May generated crater incandescence and a plume that rose 400 m. Weather conditions often prevented views during 25-27 May. On 27 May OVDAS-SERNAGEOMIN noted that the intensity and type of seismicity observed in recent days, in conjunction with the deformation data, suggested the rise of a magmatic body to shallow depths. The Alert Level was raised to Red. According to ONEMI, the government ordered a precautionary evacuation of the 2,440 people living within a radius of 25 km. During 27-28 May seismic signals were detected at an average rate of 130 events per hour. Cloud cover prevented visual observations. ONEMI noted that 44 people had evacuated by 28 May. OVDAS-SERNAGEOMIN reported that an explosion from Copahue at 1015 on 7 May recorded by a webcam produced a gas, steam, and ash plume that rose 350 m and drifted SE. Incandescence from the crater was visible at night. The Alert Level was raised to Yellow. Based on analysis of satellite imagery and a pilot observation, the Buenos Aires VAAC reported that on 28 March steam-and-gas emissions with small amounts of ash rose from Copahue. OVDAS-SERNAGEOMIN reported that during 29 January-4 February the web camera near Copahue recorded white gas plumes rising 350-1,550 m above the crater and drifting E and SE. Seismicity fluctuated but mostly remained at low levels. The Alert Level was lowered to Yellow on 4 February. The Buenos Aires VAAC noted that although a pilot reported an ash plume between the altitudes of 3-4.6 km (10,000-15,000 ft) a.s.l., no ash was detected in mostly clear satellite images. The VAAC also noted that steam with possible diffuse ash was recorded by the OVDAS webcam. OVDAS-SERNAGEOMIN reported that during 22-28 January the web camera near Copahue recorded white gas plumes rising 100-800 m above the crater and drifting E and SE. Seismicity remained at low levels. An explosion at 2355 on 22 January produced a gas plume (with no ash) that rose 1.45 km above the crater. The Alert Level remained at Orange. OVDAS-SERNAGEOMIN reported that the web camera near Copahue recorded white gas plumes rising 250-1,300 m above the crater during 15-18 January and drifting W and NW. Seismicity remained at low levels. The Alert Level was lowered from Orange to Yellow on 18 January. A seismic swarm of long-period earthquakes started at 1420 on 22 January. The earthquakes were initially deep but became shallower, and volcano-tectonic events were more frequently detected, until the next report posted at 2200. Web camera and satellite images did not show any changes. The Alert Level was raised to Orange. OVDAS-SERNAGEOMIN reported that the web camera near Copahue recorded white gas plumes rising 0.9-1.5 km above the crater during 9-15 January and drifting NNE, E, ESE, and SSE. Incandescence from the crater was observed on some nights. Satellite images showed plumes drifting 10 km E and SSE during 10-12 January. The Alert Level remained at Orange. OVDAS-SERNAGEOMIN reported that seismicity at Copahue during 31 December, and 2 and 4-5 January indicated magma movement focused at 4 km below the crater and moving to shallower depths. On 5 January seismicity increased as well as gray emissions observed with a web camera. The Alert Level was raised to Orange. Incandescence on the crater was noted during 5-6 January, and plumes rose 200 m above the crater and drifted E during 5-7 January. Based on analysis of satellite imagery, the Buenos Aires VAAC reported that on 2 January a diffuse gas-and-ash plume drifted 93 km NE and E. During 2-3 January web cameras near the volcano recorded steam-and-gas plumes drifting E and dissipating near the summit. OVDAS-SERNAGEOMIN reported that during 25-29 December white plumes observed with a web camera installed near Copahue rose 450-850 m and drifted NE and E. Plumes detected in satellite imagery drifting 16 km NE on 26 December. Incandescence from the crater was observed at night during 26-28 December; explosions were detected during 27-28 December. Seismicity had decreased during the reporting period. The Alert Level was lowered to Yellow on 29 December. OVDAS-SERNAGEOMIN reported increased seismicity at Copahue on 22 December. Seismicity fluctuated but was high and indicated that emissions from what was thought to be a phreatic eruption varied between white gas and dark ash plumes. The plumes rose 1-1.5 km above the crater and were observed in satellite imagery drifting 400 km SE. The Alert Level was raised to Orange. Scientists aboard an overflight observed a low plume rising 1.5 km above a vent in Del Agrio Crater, in the same area as the previous eruption in 2000, and drifting SE. The scientists noted that at 1600 the emissions changed from ash to gas. Later that day web cameras showed incandescence from the crater reflecting in the clouds. The Alert Level was raised to Red, and people within a 15-km-radius and along drainages were warned about potential increases in activity or lahars. On 23 December incandescence from the crater increased with explosions, as high as 450 m. Strombolian activity ejected incandescent blocks, and mostly white plumes turned dark during explosions. The plumes rose 1 km and drifted SE. On 24 December seismicity decreased. The camera recorded crater incandescence which increased to heights of 200 m with explosions. Incandescent blocks were again ejected with Strombolian explosions. Plumes rose 300 m and drifted SE; they were mostly white, but turned dark with ash during explosions. The Alert Level was lowered to Orange. On 25 December seismicity decreased to low values and tremor was not detected. Cloud cover obscured web camera views. Diffuse plumes visible in satellite images drifted 70 km SE. A series of explosions started [at Copahue (figure 1)] on 31 July at about 0900 and continued until 1133 [all times are Chile local time]. Photographs taken 10 km NE of the volcano (at Los Copahues thermal springs, Argentina) show small, cauliflower-shaped columns emerging from the E (Del Agrio) crater. Ash clouds were rapidly dispersed by SW winds, and a strong sulfur smell was noted in the area. Renewed explosions began at around 1800 and continued until about 0300 the next morning, also producing ash columns and a sulfur smell. Earthquakes had begun to be felt in the area on 30 July. Figure 1. Schematic view of the Copahue complex, showing the position of the historically active summit crater with respect to the Del Agrio and Trapa-Trapa calderas. Adapted from a map by O. González-Ferrán. Hugo Moreno overflew the summit on 1 August at 1700. Solfataric activity was intense in the E crater, and snow had melted on the inner crater walls and rim. Pyroclastic-fall deposits covered ~ 1.5 km2 of the upper NE flank, and light ashfall extended 4-5 km NE. The bottom of the active crater had previously been filled by a green, highly sulfuric, acid lake (pH about 1.5), which appeared to be covered by a grayish, cracked ash blanket. Small debris-flow deposits could be seen for 3-4 km along Del Agrio stream, which drains the crater lake through a small notch in the E rim. An explosion occurred on 2 August at 0330, and fine lapilli-fall (2-16 mm diameter) was reported 30 minutes later at Caviahue village, 15 km SE of the volcano, where hotels were filled with tourists. Small phreatic explosions occurred at 15-minute intervals during the morning. Field observations by Daniel Delpino revealed that lapilli-sized pumice to 7 mm in diameter had fallen on the volcano's snow-covered flanks. About 90% of the ejecta were accessory fragments, including rounded sulfur-rich vesicular particles. Only ~ 10% were believed to be juvenile. Four small debris flows were identified, one toward the E (Del Agrio stream), the other three toward the S (into Chile). These coalesced into one flow that turned SW along the Lomín river, which flows into one of Chile's major rivers, the Bíobío. The debris-flow deposits were a mixture of snow, ice, and pyroclastic material up to 1 m deep. Earthquakes were felt for the first time at Caviahue on 2 August between 2230 and 2245, when three had intensities of about MM II-III. An intense sulfur smell was noted throughout the area within the Del Agrio caldera that contains Caviahue and several lakes. Some of the 300 tourists at a hotel in Caviahue suffered from headaches, and they were advised to leave the area. A 20-km restricted zone around the volcano was recommended by Hugo Moreno. Additional visitors were prevented from entering the Caviahue area. There are few towns near the volcano in Chile. Guallalí is 20 km SW and Trapatrapa is 17 km NW, but many houses and small settlements are distributed along the Lomín/Bíobío and Queco rivers. The Chilean electricity enterprise (ENDESA) was warned of potential hazards because the Pangue and Ralco hydroelectric projects have camps along the Bíobío river, 45 and 35 km from the volcano, respectively. Univ de la Frontera seismologists installed two MEQ-800 seismic stations at the E foot of the volcano on 5 August, one 9 km from the active crater (near Caviahue), the other 18 km away (in Cajón Chico). During the first 8 hours, 150 harmonic tremor events were recorded (figure 2), with frequencies of 0.9-1.3 Hz. The next day, 815 events were recorded, including a 2.5-minute long-period earthquake at 1858 associated with a phreatomagmatic explosion that generated a mushroom-shaped column 700 m high. Strong winds rapidly carried the column NE, leaving a dark-gray deposit on the recent NE-flank snowfall. No eruptive activity had been reported since the 2 August explosion, but bad weather had obscured the volcano until 30 minutes before the 6 August ash ejection. Figure 2. Number of tremor episodes per hour recorded by a seismic station (Caviahue), 9 km from the active crater at Copahue, 5-9 August 1992. Courtesy of the SAVO seismological team. Daniel Delpino, Luís Mas, and Hugo Moreno overflew the volcano by helicopter during the late morning of 7 August. An elliptical airfall deposit 11 km long and 2 km wide covered the NE flank. Several secondary, gravitationally generated, flows had occurred on steep unstable talus slopes near the crater. Ballistic blocks had produced numerous impact craters to ~ 1 m in diameter in this area. Moderate fumarolic activity was occurring in the crater. S of the v-shaped notch in the crater rim, very narrow red-brownish mudflows, probably overflows of muddy crater-lake water, extended no more than 150 m. The geologists landed ~ 2.5 km NE of the crater near the tephra-dispersion axis. The dominant airfall material was accretionary lapilli 0.3-1 cm in diameter, composed of very fine sulfur-rich dust spherulites. Most of the remainder of the deposit was also accessory material, including angular volcanic lithic fragments up to 3 cm across. Small globular to ribbon-shaped vesicular glassy fragments were also found, and were interpreted as juvenile hydroclastites. A new, less-voluminous debris-flow deposit had been emplaced along the Del Agrio stream, on top of the earlier deposit. Pale-brown muddy material extended about 200 m beyond the previous flow front, ~ 4.2 km from the crater. Another overflight late on 8 August showed small fumaroles in Del Agrio crater, but no other visible activity within the 2-km-long, ENE-WSW row of summit craters, or elsewhere outside of the Termas de Copahue area. Seismicity declined after the 6 August explosion, remaining at low levels until tremor began to increase on 9 August at 0230. Between 0330 and 1230, 176 episodes of harmonic tremor were recorded, and 5 high-frequency events were detected during the same period. A 2.9-minute long-period earthquake occurred at 1057, probably marking a phreatic or phreatomagmatic explosion. However, the volcano was obscured by weather clouds, and the explosion could not be confirmed. O. González-Ferrán visited the volcano on 12-13 August, with the support of the Chilean Air Force. The source of the explosions was a new vent, 100 m in diameter at the rim and 30 m across at the base, on the outer SW flank of the active crater (figure 3). Ash deposits evident during his fieldwork extended ENE and SE, to maximum distances of 4 and 6 km, respectively. Partial melting of the glacier, 5-40 m thick, that covers the older inactive summit craters and the SSW flank, had generated at least three jökulhlaups and a small lahar that extended ~ 6 km down the S flank toward the Lomín/Bíobío river system. An ~ 60-m-long fracture (f on figure 3) below the outflow of the crater lake was the source of another small mudflow that descended the Del Agrio river toward Del Agrio lake. The crater lake, ~ 300 m in diameter with 5-6 x 105 m3 of acid water, continues to drain to the E at 2,716 m altitude. Lake level had dropped 8-10 m since the previous visit by González-Ferrán in 1990. Solfataras were active on the crater's S interior wall, and fresh landslides were visible on the SE interior wall. The glacier's headwall, 30-50 m high, is 80 m above the lake, and is the lake's main source of water. Figure 3. Sketch of the summit area (top) and locations of 1992 eruption deposits (bottom) at Copahue, 13 August 1992. The 60-m fracture that spawned a small mudflow in the Del Agrio river is marked with an "f". The approximate area shown by the summit-area sketch is enclosed by a box on the bottom drawing. Courtesy of O. González-Ferrán. Small earthquakes at 3.7 and 6.3 km depth were recorded at 0222 and 0226 on 14 August. A light-gray gas cloud extending 10 km SE from Del Agrio crater was seen at 0700. 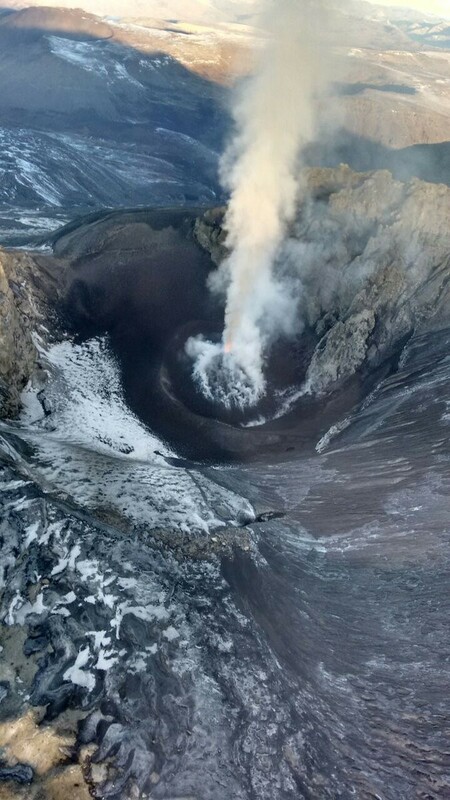 Daniel Delpino, Alberto Andolino, and Mario Deza reported strong effervescence and waves on the crater lake, which also showed strong fumarolic activity, at 1500. An explosion signal lasting 10 seconds was recorded at 1731. Four minutes later, a dense, light-gray gas cloud with dimensions of about 2 x 0.6 x 0.5 km descended ~ 4 km ESE, remaining there until about 0615 the next morning. A series of explosions and a strong increase in tremor, to 30-40 episodes/hour, began at 2100 on 14 August. During the night, the entire volcano was covered by a gaseous fog. Tremor activity was lower on 15 August, with about 20-25 episodes per hour between 0700 and 1700. Earthquakes were recorded at Caviahue at 0538, 0558, and 0645. Information Contacts: D. Delpino, A. Bermudez, and M. Pérez, Dirección Provincial de Minería, Zapala, Argentina; H. Moreno, SERNAGEOMIN-SAVO, Temuco, Chile; G. Fuentealba and J. Cayupi, SAVO-Univ de la Frontera, Temuco, Chile; Oscar González-Ferrán, Univ de Chile. Figure 4. Preliminary geologic map of Copahue, showing outlines of Pliocene and Pleistocene calderas, post-caldera lava flows, faults, and fumaroles (not including the one in Del Agrio crater). Distribution of airfall tephra from the 3 main 1992 explosions is also shown. Contour interval, 100 m. Courtesy of A. Bermúdez and D. Delpino. Eruptive activity and seismicity, 15 August-20 October. Fumarolic activity was continuous through mid-October, occasionally accompanied by rhythmic explosions. Roaring noise typically preceded the rise of a vapor cloud by some minutes. Fumarolic activity and explosions originated from the same area in the S part of the crater lake. The entire lake was obscured by an intense vapor cloud on some days. The level of water in the lake remains unchanged. Successive explosions have melted the ice on the crater walls, leaving them completely ice-free (unusual at this time of year), and covered the walls with ejecta. Experienced mountaineers often climbed to the crater, reporting an intense sulfur smell and rapid development of eye irritation (perhaps from hydrochloric acid vapor). The following is from the Grupo de Estudios Vulcanológicos, Proyecto Riesgo Volcánico de Neuquen. Emission of the light-gray gas cloud reported 15 August was accompanied by increasing harmonic tremor activity (~ 40 episodes/hour) and three high-frequency shocks. Between 18 and 21 August, 80 long-period events were recorded, some of which coincided with phreatic and phreatomagmatic explosions. Material from some of the explosions remained inside Del Agrio crater, but on 19 August, mushroom-shaped columns ~20 and 50 m high were seen. At 1700, a phreatomagmatic explosion from Del Agrio crater fed a gray column ~100 m high. The column rapidly drifted SE, covering the flank with a dark-gray airfall deposit. A heavy snowstorm obscured the volcano 20-23 August, but when weather cleared on the 23rd, dark gray material was visible on the flank. Tremor episodes became increasingly frequent (~ 80/hour) 24-26 August, and nine new long-period events coincided with explosions that ejected dark-gray material. Event durations ranged to 2 minutes 10 seconds. Tremor was harmonic with some high-frequency activity, particularly on 25 August, when high-frequency tremor alternated with harmonic episodes at rates of ~100/hour. Fumarolic activity from Del Agrio crater was accompanied by a light-gray gas cloud on 24 August. Three high-frequency shocks and two long-period events were recorded on 27 August, as intense fumarolic activity formed a dense cloud that covered the crater and appeared to flow toward the E.
A strong increase in tremor episodes (to around 200/hour) characterized the period 28 August-3 September. Ten small high-frequency shocks were recorded 28-30 August. The largest, on 29 August at 1117, had an amplitude of 34 mm and a duration of 35 seconds. It was felt in Caviahue (15 km SE of the volcano) and was accompanied by an explosion sound. Intense fumarolic activity occurred inside the crater 1-2 September. Dense, white, mushroom-shaped clouds sometimes formed within the crater, and others rose 50 m above the summit. Some were light-gray, suggesting the presence of gases other than water vapor. On 3 September, two high-frequency shocks were detected, with a maximum amplitude of 21 mm. Intense tremor activity continued 4-9 September, including some high-frequency episodes. Tremor decreased somewhat and became banded 10-17 September, with bands of less-frequent episodes (40-50/hour) of low amplitude alternating with those of more-frequent (100-150/hour) stronger tremor. Four small high-frequency shocks were recorded on 16 September (maximum amplitude, 17 mm) but no long-period events were detected. Tremor decreased in amplitude and duration 17-24 September, but was present on all seismograms. Some tremor was banded, and other episodes alternated with quiet periods. Three high-frequency events were recorded on 23 Spetember, one of which (at 0247) was felt at MM II in Caviahue. Four long-period events were registered during the period, but cloud cover and persistent snowfall prevented visual observations. The number of tremor episodes diminished drastically 25 September-11 October. Two patterns were evident, one with isolated periods of tremor on otherwise quiet records, the other (less common) in which weak harmonic tremor covered the seismogram, followed by quiet intervals of 2-5 minutes, then high-frequency tremor. A long-period event lasting 3 minutes on 1 October accompanied an explosion that ejected material. Tremor increased slightly 12-20 October, and five small high-frequency shocks were recorded. Preliminary information from the Copahue geothermal field, 4 km NNE of Del Agrio crater, indicates no substantial changes. Snow continues to prevent road access to the geothermal field. Petrology. Samples obtained from debris flows are composed of: lithics; rounded fragments of argillaceous white material; black, shiny fragments of uncertain composition; and small, globular to ribbon-shaped greenish particles. Proportions and size distributions of each component are still being determined. X-ray diffraction shows that the greenish particles are composed entirely of sulfur. Morphology and grain size resemble scoriae, with vesiculated surfaces and interiors. Some show elongation and separation into branches with ball-like terminations. Others are tiny spheres, sometimes deformed and flattened, or Pele's tears. Geologists proposed an eruptive mechanism producing pyroclastic sulfur scoriae similar to those at Poás (Bennett and Raccichini (1978) and Francis and others (1980). Monitoring. An MEQ-800 seismograph owned by INPRES (Argentina's National Institute of Seismic Warning) and operated by residents of Caviahue municipality is positioned 7.5 km ESE of the active E (Del Agrio) crater. Seismic data and visual observations are telephoned daily to volcanologists Adriana Bermúdez and Daniel Delpino. 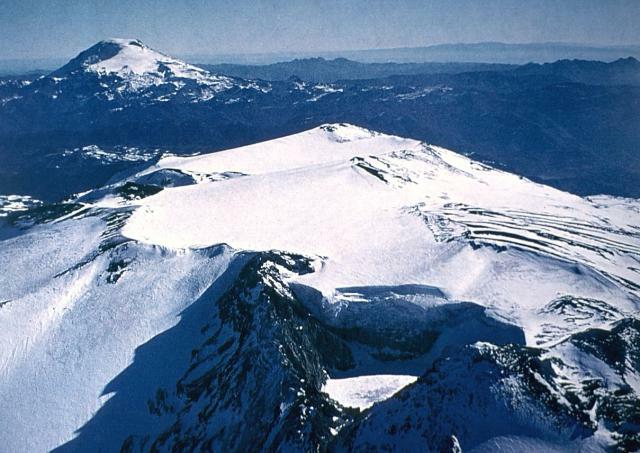 After 1 September, Delpino left his monitoring post in Caviahue, but he and Bermúdez visit the volcano when activity warrants. Seismograms are sent once a week for reading by the volcanologists, and monthly to INPRES for final interpretation. The provincial government has established the Technical Group for Volcanological Studies to work on the Volcanic Risk Project of Neuquen Province, covering all active volcanoes in the province. A program of volcanological monitoring, detailed mapping, and preparation of a risk map for Copahue has the support of the provincial government. The limited seismic and volcanological monitoring have not revealed a consistent pattern of eruptive behavior at Copahue. For example, no relationship is apparent between increases in fumarolic and tremor activity, or between explosions and high-frequency shocks. References. Bennett, F.D., and Raccichini, S.M., 1978, Subaqueous sulphur lake in Volcán Poás: Nature, v. 271, p. 342-344. Francis, P., Thorpe, R., and Brown, G., 1980, Pyroclastic sulphur eruption at Poás volcano, Costa Rica: Nature, v. 283, p. 754-756. Information Contacts: D. Delpino and A. Bermúdez, Dirección Provincial de Minería, Neuquen, Argentina. A late-March overflight made after a prolonged dry season enabled scientists to see Copahue with relatively low snow levels. The lake level was some meters below the prominent notch through which drainage occurs on the ESE side of the crater. Light-gray mud deposits from recent overflow events extended halfway down the E flank. Deposits were also observed to the S and formed a small laharic fan of highly altered material near the head of the Río Lomín. A pH of 2 was measured in Río Lomín in 1995; in contrast, during March the pH was neutral in the headwaters draining off the lahar fan. However, farther downstream the Río Lomím captures the Estero Turbío, which drains the S flank of the volcano and ran orange, presumably due to high acidity. After capturing Estero Turbío, Río Lomín reportedly became acidic and remained so all the way to its confluence with the Río Biobío, ~33 km from the volcano. Information Contacts: Jose Antonio Naranjo, Servicio Nacional de Geología e Minería (SERNAGEOMIN), Av. Santa María 0104, Casilla 10465, Santiago, Chile; Hugo Moreno Roa, Observatorío Volcanogía de los Andes del Sur (OVDAS), Manantial 1710-Carmino del Alba, Temuco, Chile; Simon R. Young, British Geological Survey (BGS), Murchison House, West Mains Road, Edinburgh EH9 3LA, United Kingdom. An eruption of Copahue (figure 5) began on 1 July 2000. Ash-and-gas emissions, which have continued into late July, are considered to be Copahue's most vigorous activity in the past century. Reports were received from geologists in Argentina and Chile. Except where otherwise noted, Argentine geologists Adriana Bermúdez (CONICET) and Daniel Delpino (Civil Defense of Neuquén Province) reported information for 1-9 July, and Chilean geologists José Naranjo and Gustavo Fuentealba (both of SERNAGEOMIN) reported information from 10-13 July. The scientists submitted joint reports beginning on 13 July. All time references are to Argentina local time; Chilean time is one hour earlier (GMT - 4 hours). Figure 5. Preliminary geologic map of Copahue, showing outlines of Pliocene and Pleistocene calderas and post-caldera lava flows. Contour interval, 100 m. Modified from a previous map in BGVN 17:10. Courtesy of A. Bermúdez and D. Delpino. Initial explosions, 1-2 July. Although visibility was poor in late June, at 0030 and at 0430 on 1 July local Argentine police and gendarmerie (National Guard) reported ash mixed with heavy snowfall, as well as a strong sulfur smell. At around 1145, lapilli and ashfall became heavier, eventually covering the snow and the products of previous eruptions around the summit. At 1200 the gendarmerie reported lapilli falling 7.5 km NE of the volcano, in the village of Copahue, Argentina. The alert status was set at yellow; the village's emergency committee restricted tourist access and helped to evacuate 200 people. Explosions continued throughout 2 July with increasing intensity. Lapilli, ash, and sporadic bombs (15 cm in diameter) fell 8-9 km E on the town of Caviahue, Argentina, with up to 15 cm of materials from the day's explosions eventually being deposited in some areas (figure 6). Until 2345 there were explosions of varying intensities. Preliminary results of an examination of the deposits revealed that they were composed of a very fine silica, sulfur particles, accidental rock fragments from the conduit, and juvenile materials. In Caviahue, visibility was practically zero due to ash particles in the air, and heavy ashfall cut off power for several hours. By midday, eruption plumes blowing SE reached Loncopué, a small village 50 km from the volcano. Figure 6. Ashfall from the frequent eruptions that began [1 July] at Copahue and heavy snowfall have affected the reliability of power and potable water resources in the town of Caviahue, a popular ski area 8-9 km E of the volcano. Although the town is no longer under official evacuation, many inhabitants have not returned to battle current conditions. Courtesy of A. Bermúdez and D. Delpino. Alert status was raised to orange on 2 July when ash was dispersed as far as 100 km away from the crater and the plume covered a total area of 2,000 km2. Maximum ash accumulation of 3-5 cm occurred over an area of 6 km2, including the town of Caviahue and the W sector of Lake Caviahue. Due to the ashfall, the surface of Lake Caviahue changed color from its normal deep blue to gray-green, and a water sample taken had a pH of 2.l. Tests by Argentine geologists on ash samples deposited in Caviahue revealed a grain-size distribution of 15% coarse ash (> 1 mm), 80% fine ash (0.5-1.0 mm), and 5% fine ash dust (< 0.5 mm). The coarse ash contained a small quantity of juvenile and lapilli-sized (3-6 mm) accidental fragments; the juvenile materials were dark gray vitric scoria. Non-juvenile accessory materials accounted for 7-10% of the coarse ash and consisted primarily of white-gray silica from the bottom of the crater lake. The fine ash-sized particles had similar components and characteristics. Irregularly shaped dark gray scoriae, 3-8 cm in size, were found as far as 12 km N of the crater; scoriae completely covered the area within a 1.0-1.5 km radius around the crater. The scoriae contained spherical vesicles 3-5 mm in diameter. Cooling cracks marked the scoriae's surfaces and their shapes had been modified during flight. Ashfall was also reported 60 km SE of the volcano in the town of Loncopué, where the stream closest to the volcano had cloudy brown-gray waters. Continuing activity through 25 July. Activity decreased after 2345 on 2 July. The only explosion of 3 July, at 1720 in the main crater, deposited tephra on the flanks and generated a dense, dark gray ash plume that blew NW and produced a local ashfall. According to the Buenos Aires Volcanic Ash Advisory Center, the ash plume reached an altitude of 10.6 km and blew NE. On 4 July there were explosions at 1030, 1830, and 2000. In the town of Caviahue, Delpino noted a strong sulfur smell and great booming sounds that caused windows to shake. A dark gray ash plume rose 2 km above the summit. Bermúdez and Delpino reported that at 0020 on 5 July a new cycle of rhythmic explosions began; by 1325 a total of 37 explosions had occurred. The biggest explosion, at 0515, generated a pyroclastic surge down the E and N slopes. A report was received on 5 July from Ralco-Lepoy, a town 30 km SW of the volcano, indicating that dead fish had washed up along the banks of the Lomín river. The Lomín, as well as the Agrio river, which drain the acidic, active crater, were marked by a deep, dark-colored gully but there was no evidence of lahars. However, it is possible that ashfall covered up the evidence. The dead fish found along the Lomín River on 5 July confirmed that acidic mudflows from the crater had been channeled down this river. Chilean geologists Naranjo and Fuentealba recommended that states bordering the Lomín river (to the SW) and Queuco to Trapa-Trapa (to the N) be alerted that an acidic mudflow was moving down the river. Accordingly, authorities noted that inhabitants should be evacuated outside of an enforced safety radius. It was also recommended that professionals regularly measure the pH of affected Lomín drainages, meteorological reports be kept up to date, and that town officials periodically reevaluate the yellow alert. Naranjo and Fuentealba also noted that at 2030 on 5 July a patrol of carabineros (Chilean National Guard) approached the volcano on horseback and observed small dark ash emissions moving SE from the volcano. Observers in Argentina during the night of 5-6 July reported an incandescent pyroclastic emission flowing down the cone and, at one point, a white light emanating from the crater for ~15 seconds. In the same time interval, gendarmerie officers from Copahue village described "an orange-red light coming up from the crater." It is thought that the light was produced when magma rose to the surface but did not spill over the crater walls. They also noted the vertical ejection of large incandescent blocks that fell back into the crater, as well as smaller incandescent fragments that fell onto the volcano's slopes, rolled downhill, and broke up into smaller pieces. On 6 July, Delpino reported to Naranjo and Fuentealba from Caviahue that the eruption was Strombolian with explosion pulses every 1-2 hours. Winds blew ash S of Caviahue without any ashfall in the town. There was no evidence of lahars or floods. Throughout the morning of 6 July snow continued, and there was zero visibility of the volcano. Bermúdez and Delpino reported that during 0100-1020 on 7 July, loud explosions and ash emissions occurred at 15-minute intervals. At about 2000, the wind changed, blowing W, and ash began falling over Caviahue. About 1 mm of ashfall was observed from 20 km W of the crater. The same day, ice blocks 15-20 cm in diameter, as well as ash and lapilli, were carried down the swollen Agrio river from the volcano's permanent ice cap. At 1300, a sample of the river water taken at the bridge near Caviahue had a pH of 2, and at 2000 a sample from the same location had a pH of 1.5. The Dulce stream source lies 4.5 km E of the cone and it flows 5.5 km W of the cone into Lake Caviahue. Ashfall altered the stream's typical pH of 7 to a pH of 2.5. Preliminary investigations by Argentina's Provincial Water Division also indicated an increased iron content. A loud explosion summit at 0300 on 8 July awakened citizens of Caviahue; a day-long ash emission moved SE through clear skies. On 9 July at 0100 a glowing light was seen over the crater, but cloud cover obscured visual observations throughout the day. Naranjo and Fuentealba reported that on 10 July, explosions were gray to dark brown and it is thought that the ash fell over a 25 km2 area to the W, in the direction of Chile. Ash reached the summit of neighboring Callaqui volcano, covering it in gray ash. Samples from this ashfall taken 4 km W of the active crater were found to contain juvenile volcanic glass fragments, 0.3-0.5 mm in diameter. During 1200-1230 on 12 July, a Chilean overflight revealed that explosions inside the active crater (El Agrio) occurred at 1- to 3-minute intervals, ejecting fine material up to 500 m above the crater. This material was dispersed via a plume of fine ash and gases moving NNE for more than 250 km. Observers reported that 1-2 mm of fine ash was deposited in the village of Copahue. Throughout the day, activity increased and, at 2300, there was an explosion heard in Caviahue that was thought to have deposited 1-2 cm of ash 5 km NNE of Copahue. On 12 July, scientists noted that Copahue was in an eruptive phase of lower intensity (a Volcano Explosivity Index, VEI, of 1) compared to that seen on 1-2 July (an inferred VEI of 2). At 1100 on 13 July, explosions generated white-gray to bluish gas emissions rising 200-300 m over the crater. A gas cloud with a strong sulfur odor remained trapped in the Agrio valley over a 10 km2 area; it later descended, and strong winds spread it over a 20 km2 area. At 2310, an explosion produced a 1-km-high plume and incandescent fragments were ejected onto the flanks of the cone reaching up to 1 km from the crater. The plume covered Caviahue, obscuring the moon, but there was no ashfall on the town. A Chilean helicopter flight on the morning of 13 July observed explosions emitting pale gray ash columns up to 300 m above the crater rim. Winds dispersed the ash ENE to Caviahue. Carabineros sampling water at the source of the Lomín river found it slightly acidic (pH = 5-6). At 1250 on 13 July, an eruption plume that rose 3-5 km over the crater was reported by military and civilian pilots. The column dispersed to the NE and was a reddish-brown color. Reports from Caviahue stated that on 15 July the eruption stayed at the same intensity as previous days, and fine ash was dispersed to the N. Ash samples from 13 July were found to have an andesitic composition and to include juvenile fragments, the presence of which indicates the volcano's potential to produce even larger explosions. Water samples from the Lomín river on the same date revealed high fluorine and sulfate levels. At 1700-1730 on 16 July, and also between 0300 and 0400 on 17 July, a dusting of ash fell over Caviahue and there was a strong sulfur smell in the air. At 0905 on 18 July, a civilian pilot reported a pale gray ash column at 3.5-4 km above sea level (just over the top of the cordillera) dispersed over 10 km to the volcano's NNW. At this time, the ongoing eruptions were considered to be of VEI 1. Ash from the weak explosions was dispersed by low winds as it escaped from the crater. At 2206 on 19 July, members of the gendarmerie reported that a series of explosions continued to generate columns of ash and water vapor 0.5-1.0 km above the crater. The plumes dispersed to the NE depositing a fine dusting of ash over the village of Copahue. A strong sulfurous odor was reported at 2100 in Caviahue. On 20 July activity remained low, and no noises or odors were detected. Winds carried the gas-and-ash plume NNE, depositing a light ashfall over the N sector of Caviahue. On 21 July, light ashfall dusted Caviahue and, although the crater was obscured, ash columns were sighted rising above the summit and through the clouds to heights of 700-1,000 m. At 1048 (Argentina), Caviahue residents heard a series of rhythmic explosions occurring every 2-5 minutes for one hour. The plume carried ash NNE toward Trapa-Trapa. The volcano was obscured by cloud cover on 22 July but intermittent explosions continued emitting ash plumes carried NE toward Trapa-Trapa. A seismological team from the Southern Andes Volcanological Observatory (OVDAS) installed a portable seismic station on 21 July at a spot ~2 km NNW of the active crater in the vicinity of Trapa-Trapa, Chile. After taking 15 hours of readings, the team left on 23 July after cold temperatures had prematurely reduced battery power. These readings were fortunately during a time of elevated activity, and registered seismic events generally correlated with visual observations. Despite this similarity, it was impossible to establish an exact correlation between the periodicity of the explosions (occurring every 1-3 minutes) and their microseismic signals at distance. During the stay of the seismic team, no ashfall was reported in the Queco river region and no correlation was established between seismicity and sporadic thundering sounds reported by villagers in the area. These sounds have been attributed to chunks of the ice cap breaking off and rolling down Copahue's flanks. Due to over 3 m of snowfall, access to the area is difficult. Explosions of low to intermediate intensity continued emitting ash-and-gas plumes on 23 July. The clouds continued to partially obscure the volcano, but at 1930 an ash column blew E toward Caviahue. On 24 July, the active crater was producing small explosions and dark gray ash emissions; a dusting of ash fell over Caviahue. When the Argentina gendarmerie and the Chilean carabineros compared respective observations no discrepancies were found. Two pilots reported a strong sulfur odor at 1.8-2.1 km altitude, ~250 km WSW of Copahue on 25 July. At 1000 another pilot reported an ash plume extending 200 km WNW from the summit; plume height was ~2 km and width was 10-15 km. Although this explosion was not seen from Caviahue, a light ashfall fell over the town. Due to the continued frequent ashfalls over Caviahue, town officials decided to reestablish a yellow alert. The prolonged fall of fluorine-rich ash has posed a possible problem for grazing animals in the affected fields, but heavy snowfall has made it less likely that vegetation will absorb the fluorine. Background. Volcan Copahue is a composite cone constructed along the Chile-Argentina border. The cone lies within an 8-km-wide caldera formed 0.6 million years ago at a spot near the NW rim of the Pliocene, 20 x 15 km Del Agrio caldera. Copahue's eastern summit crater, part of a 2-km-long, ENE-WSW line of nine craters, contains an acidic crater lake (also referred to as Del Agrio) and displays intense fumarolic activity. Infrequent explosive eruptions have been recorded since the 18th century. Eruptions in 1992 and 1995 produced several phreatic and phreatomagmatic explosions and emissions that contained higher levels of water vapor but lower ash particle content than the current eruption. The current eruption has been of longer duration than either of the previous two. The Agrio river emerges from a crack in the edifice of the volcano 50 m below the active El Agrio crater. The river water is highly acidic and has a yellow color. Near Caviahue, the Agrio river enters the Caviahue lake basin. The lake is formed by 2 glacial finger lakes over a 9.2 km2 area and is a reservoir of acidic water. Most residents of Copahue village leave each winter, but Caviahue's population of 400 can grow to 10,000 during the ski season. Eruption-related damage has cut off power and potable water, and there remains an inability to keep ski slopes cleared of ash. In late July there were reportedly only about 419 people staying in Caviahue. Information Contacts: Adriana Bermúdez, National Council of Scientific and Technical Research (CONICET) and the National University of Comahue, Buenos Aires 1400, Neuquén Capital, Argentina; Daniel Delpino, Advisor to the Civil Defense of Neuquén Province, Argentina and the National University of Comahue, Buenos Aires 1400, Neuquén Capital, Argentina; José Naranjo, National Geology and Mining Service (SERNAGEOMIN), P.O. Box 10465, Avda. Santa Maria 0104, Providencia, Santiago, Chile; Gustavo Fuentealba, Southern Andes Volcanological Observatory (OVDAS), SERNAGEOMIN, P.O. Box 10465, Avda. Santa Maria 0104, Providencia, Santiago, Chile; Buenos Aires Volcanic Ash Advisory Center, Argentina (URL: http://www.ssd.noaa.gov/ VAAC/OTH/AG/messages.html). The most vigorous eruptive activity at Copahue in the last century began on 1 July 2000 (BGVN 25:06). Lapilli, ash, and sporadic bombs fell within 9 km of the crater, and ash was dispersed as far as 100 km away on the second day of eruptions. Frequent explosions throughout July generated ash columns that often caused ashfall over the villages of Copahue to the N and Caviahue to the E.
Between 0700 and 1200 on 4 August, Ramon Ortíz and technician Erwin Medel (OVDAS) installed a portable seismic station in the Queuco river valley, 16 km N of Copahue. The instrument detected a fracture-type earthquake that probably originated from the volcano, but the depth could not be determined. During 3-5 August, explosions were not noted in the Trapatrapa sector, and acidic rainfall in the Queuco river valley has not occurred since mid-July. According to residents of Caviahue, on 5 August gray spots were observed on the snow, possibly caused by fine ashfall. Apparently, eruptive activity during the previous two weeks included a greater amount of steam as a result of melting snow. A strong sulfur odor was detected in Caviahue on the night of 7 August, but there was no ashfall. Seismic data and observations from Caviahue indicated increased activity starting on 9 August. Explosions that morning generated columns up to 4,500 m altitude that dispersed W over Chilean territory, into the Trapatrapa valley area, and during afternoon towards the Lomín river valley. The elevated activity continued through at least 1600 on 10 August, with small explosions at intervals of 5-10 or more minutes. On the night of 15 August incandescence in the crater was observed from Caviahue. Up to fist-sized fragments ejected during explosions fell back into the crater. People who approached the crater reported steam explosions composed of white clouds alternating with dark-gray ash emissions. Explosions occurred every 4-5 minutes. A ski instructor from Caviahue, Daniel Maniero, observed the volcano under clear conditions on the evening of 17 August. Around 2100 that night intermittent incandescence in the crater was followed by thundering noises at intervals of 5 minutes. Clouds reflected crater incandescence on the night of 19 August. Maniero also reported that loud explosions every 8-10 seconds were heard near the crater on 20 August. During 20-21 August intermittent black ash clouds rose not more than 300 m, causing local ashfall around the crater. Scientists from SERNAGEOMIN-OVDAS, Eliza Calder and Ramon Ortiz, monitored seismicity in the Trapatrapa area, ~16 km NNW of the volcano, from the afternoon of 18 August to 1100 on 19 August. They observed low and weak gray clouds. Between 1839 on 18 August and 0940 on 19 August one long-period earthquake was detected at 0036 on 19 August. According to the Argentina Gendarmerie, during that night there was a strong explosion. Seismic registries showed low-level seismicity without high-frequency earthquakes. On 19, 21, and 23 August there were strong explosions with dark ash clouds. On the morning of 22 August an observer using binoculars on a commercial flight noted steam clouds extending 5 km N and S of the crater area as well as explosions that rose up to 500 m above the cloud layer located at ~3,000 m altitude. Direct observations carried out at 1000 on 1 September indicated the development of small explosions in the interior of the crater, where an increase in both ash accumulation and the diameter of the explosion crater were observed. The crater measured ~50 m across. Another eruptive cloud was observed from a commercial aircraft (LAN flight 991) on the morning of 2 September; it dispersed toward the N at a height of 700-1,000 m above the crater (3,700-4,000 m altitude). Data registered by the MEQ-800 seismic station maintained by Instituto Nacional de Prevención Sísmica (INPRES) of San Juan, Argentina during 11 August-4 September, and registries obtained by a digital seismic station at the Volcanólogico Observatory (OVDAS) of SERNAGEOMIN, Chile, in the locality of Caviahue, Argentina, were used to correlate seismic and volcanic activity. Correlations were made between some periods of tremor, or periods of intense tremor separated by quiescent periods, that corresponded with later ash emissions. On 15 August rockfall events were detected. Long-period events were registered on 20 (140 seconds) and 21 August (120 and 104 seconds). The new OVDAS station consists of an L4C seismometer with an analog-digital card converter, and a portable HP 2000 XL computer. The station was installed in Caviahue, 7 km from the crater, and buried to a depth of 70 cm to protect it from wind effects. The registered microseismic activity in Caviahue was significantly better than data obtained in Trapatrapa, over 15 km NW of the volcano in Chile. Data collection began at 0900 on 26 September. The activity consisted of short-period events associated with volcanic activity. Some events were associated with small crater explosions. A long-period event at 1946 on 23 September was followed approximately 4 hours later by a small ash emission. Although it is not always possible to directly correlate the recorded seismicity with eruptive events, it is evident that there is a close correlation between long-period events and later ash emissions. The appearance of tremor bands is also important and considered precursory to ash emission. At dawn on 23 September, observers in Caviahue saw intense gaseous emissions in pulses of 30-60 seconds that rose up to 150 m above the crater and dispersed NNE. During that night the crater appeared incandescent. On 24 September the presence of snow was verified in the crater interior, indicating a reduction in temperature. Activity with similar characteristics occurred during the first half of October. Seismographs installed in the area detected microseismic tremors on 17 October. Between 1145 and 1245 of 18 October, constant steam emission occurred along with some denser emanations of brown color and fine ash. The inner crater diameter had not changed noticeably since mid-September, except for a new levee that resulted from wall collapse. On 19 October a thermal anomaly was detected by the GOES satellite, but there were no explosions. Information Contacts: José Antonio Naranjo, Jefe, Departamento Geología Aplicada, Servicio Nacional de Geología y Minería (URL: http://www.sernageomin.cl/); Gustavo Fuentealba, Paola Peña, Eliza Calder, and Ramón Ortíz, Servicio Nacional de Geología y Minería, OVDAS (URL: http://www.sernageomin.cl/); Adriana M. Bermúdez, Investigadora Científica, CONICET, Argentina; Daniel H. Delpino, Asesor Dirección Provincial de Defensa Civil de la Provincia del Neuqué. Our last report on Copahue volcano described the phreato-magmatic eruption of July 2000 (BGVN 25:06). Up until July 2012, activity at Copahue was characterized by passive degassing. In this report, we summarize the changes registered from Copahue which culminated in minor ash eruptions. According to Instituto Nacional de Prevención Sísmica (INPRES), a phreatic eruption occurred on 19 July 2012 and Servicio Nacional de Geologia y Mineria (SERNAGEOMIN) reported that ash emissions continued intermittently during December 2012-December 2013. INPRES and Forte and others (2012) noted that seismicity increased in the region of Copahue after the Mw 8.8 earthquake that occurred 3 km W of the Chilean shoreline on 27 February 2010. This activity was coincident with a progressive increase in fumarolic activity from the crater lake, El Agrio. A dense plume of vapor and acidic gases were frequently observed between 200-300 meters above the crater rim (figure 7). Figure 7. Vapor and acidic gases rose in a column from Copahue crater lake on 17 July 2012. Courtesy of Nicolas Sieburger, a local guide who frequented the area. According to Vélez and others (2011), differential interferometry (DInSAR) studies performed with ENVISAT radar images of Copahue's flanks suggested changes in deformation trends dominated by deflation during 2003-2008 and inflation during November-December 2011. A deformation map constructed between November 2011 and Aril 2012 showed uplift with displacements up to 7 cm (Vélez, 2012). During March 2012, acidic water from the crater lake and hot springs on the E flank of the volcano was analyzed by Caselli and others (2012) and Agusto and others (in progress). The acidity (pH2, Cl, and F) showed unusually high values. These investigators also highlighted a significant decrease in the level of Copahue's crater lake waterline. In July 2012, several seismic events of high and low frequency spectral content were reported by INPRES. Simultaneously, intense bubbling was observed in the SW area of Copahue's crater at an interval of 1 to 3 minutes (figure 8). A small explosion was reported on 17 July 2012 and photographed by a local guide (figure 9); it consisted of phreatic manifestations up to 10 meters high. Figure 8. The crater lake of Copahue volcano on 17 July 2012: (A) the main emission point of intense bubbling was associated with steam, gas, and patches of sulfur floating on the lake surface; (B) detail of the area of bubbling. Courtesy of NicolÁs Sieburger. Figure 9. A phreatic explosion from the SW sector of Copahue's crater lake during 17 July 2012. Although this photo lacks a scale and includes local clouds and/or steam, it is clear that the eruption plume was nearly black in color. Courtesy of Nicolás Sieburger. On 19 July 2012, another phreatomagmatic explosion occurred with emissions of pyroclastic material that, according to SERNAGEOMIN, producing a plume that extending for ~18 km ESE (figure 10). The resulting proximal tephra included ash and fine- and coarse-sized lapilli up to 20 cm in diameter. A sample of this event recovered from the crater mainly consisted of sulfur-rich clasts with a low percentage of pumice fragments, scoriae fragments, irregular argillaceous white material, and accidental fragments. The pyroclastic material sampled displayed variable sizes (3-4 mm in diameter), mostly including globular morphology, and contained vesicles. Other morphologies included perfect spheres and elongated forms and like deformed drops (figure 11, A and B). Regarding glassy particles, different classes were identified according presence, size and shape of the vesicles, as vitreous pumiceous shards, platy, cuspate and blocky glass shards (figure 11 C and D). Further details of the particle morphology were obtained with SEM analysis (figure 12). Vitreous fragments showed similar composition to those described in 2000 eruption. Figure 10. In this false-color Landsat satellite image of Copahue, the region affected by the 19 July 2012 ash plume is within the 20 km long, ESE-trending ellipse. Courtesy of Laura Vélez (GESVA). Figure 11. Low magnification photo micrographs looking at key components from Copahue's July 2012 tephra deposits. Fragments shown are less than 4 mm in diameter and were chosen to highlight morphologic differences between sulfur particles (A and B) and vitreous shards (C and D). Photograph by R. Daga, Laboratorio Análisis por Activación Neutrónica (CAB-CNEA). Figure 12. Scanning Electron Microscope (SEM) images of particles deposited from Copahue's July 2012 eruption. Images as follows: (A) subspherical sulfur particle; (B) botryoidal sulfur particle; (C) blocky and glassy particle; (D) fibrous glassy particles. Note the scale bars represent 500 μm for images A, C, and D while the scale bar for B is 1000 μm. Photograph by R. Daga, Laboratorio Análisis por Activación Neutrónica (CAB-CNEA). A seismic array from the Grupo de Estudio y Seguimiento de Volcanes Activos (GESVA) had been installed near the town of Caviahue and it registered a wide range of seismicity during July 2012. GESVA documented volcano-tectonic events, hybrid events, long period events, tremor at various frequency ranges including harmonic tremor, and explosions. Several seismic swarms were reported during the phreatomagmatic eruption on 19 July 2012. GESVA is an investigative program within the geological department of the University of Buenos Aires. Continued unrest December 2012-December 2013. The Observatorio Volcanológico de los Andes del Sur-Servicio Nacional de Geologia y Mineria (OVDAS-SERNAGEOMIN) reported on 22 December 2012 an alert change from Orange to Red Alert at Copahue. This report highlighted the onset of harmonic tremor which lasted for 5 minutes and was immediately followed by two explosions. A camera maintained by OVDAS (~18 km SE) captured images of incandescence up to 200 m above the crater that correlated with the timing of the explosions. The observed height of the plume was between 1-1.5 km and it drifted SE (Figure 13). Figure 13. This photographer captured scenes of the rising ash plume from Copahue on 23 December 2012. The lighter cloud in the background is probably a non-volcanic, lenticular cloud, a feature often associated with mountains. Photograph from the Municipio Caviahue-Copahue courtesy of La Nación. Local newspapers reported that, on 23 December, ashfall and sulfur odors were limited to the proximal towns of Zapala (~150 km SE) and Cutral Co (~210 km SE). There were some reports of local citizens self-evacuating from the area due to anticipated ashfall. People within 15 km of the volcano and along drainages were warned about a potential increase in activity potentially including lahars. The municipalities of Villa La Angostura and Bariloche, located ~340 km S within Argentina, were not at risk during this event. In contrast, they had experienced heavy ashfall in 2011 due to Puyehue-Córdon Caulle's eruption. The Buenos Aires Volcanic Ash Advisory Center (VAAC) reported at 1400 on 22 December 2012 that satellite images revealed a 110 km ash plume extending SE of Copahue; the plume was white and gray (figure 14). The plume persisted in satellite images during the next day, although its aerial extent later became restricted near the summit. By 24 December, the 22 December ash was only detected in an isolated area over the Atlantic Ocean. Figure 14. The Buenos Aires VAAC released maps for the observed (left) and forecasted (right) location of Copahue's ash plume from 22 December 2012. A 12 hour and 18 hour forecast was also released that extended the plume due E, reaching the Atlantic Ocean. Later images disclosed a detached plume out over the Atlantic Ocean (see text). Courtesy of Buenos Aires VAAC. VAAC reports indicated minor and possible ash emissions at the volcano on the following dates: 27, 28, and 30 December 2012; 2, 5, 9, and 10 January 2013; on 4 February; 28 and 29 March; on 12 April; on 15 November (possible ash was reported on 21 and 22 November). VAAC reports were also released intermittently during January-November 2013 due to gas emissions. SERNAGEOMIN reduced the Alert Level from Red to Orange on 23 December 2012. The level was reduced again, on 28 December to Yellow, and was maintained until 5 January 2013 when seismicity increased (including three spasmodic tremor events). The webcamera also documented an increase in degassing that appeared to be gray and drifting E on 5 January; the Buenos Aires VAAC was able to track this minor ash plume. Alert Level Orange status continued until 17 January when it was decreased to Yellow. The Alert Level fluctuated later in January (to and from Orange Alert) based on changing conditions which frequently included seismic swarms. One significant swarm, for example, occurred on 22 January. Periodic incandescence was observed during February-May and SERNAGEOMIN reported small explosions of gas with minor ash on 7 and 15 May. On 19 May, OMI (Ozone Monitoring Instrument) detected elevated SO2 emissions within 300 m above the crater. During 20 and 22 May, satellite images detected gray-colored plume that drifted up to 100 km SE. On 23 May, incandescence was observed as well as an increase in SO2 flux as measured by the OMI satellite measurements; that activity triggered an increase in Alert Level to Orange. Red Alert was announced one time in 2013 when, on 27 May, a seismic swarm began at a time of high RSAM measurements. An evacuation order was declared by SERNAGEOMIN that day for an area surrounding the volcano with a 25 km radius; they stated that the intensity and type of seismicity observed in the last few days and the deformation of the volcanic edifice suggested the rise of a magmatic body. Army trucks and buses were made available for the ~2,240 residents within that area, primarily those living in Alto Bío Bío. The swarm continued for several days into June. The Alert Level was reduced to Orange by 3 June. Local news sources reported that residents were authorized to begin returning to their homes on 6 June. The Alert Level was reduced to Yellow on 12 June and was maintained through the rest of 2013. On 4 June 2013, the Hyperion sensor onboard the satellite EO-1 observed Copahue at 1333 UTC and a thermal anomaly was detected from the summit area of the volcano (figure 15). The calculated temperatures ranged from ~377 to ~647°C (personal communication, Ashley Davies, NASA Jet Propulsion Laboratory). Figure 15. This satellite image captured a small point of elevated temperatures with the Hyperion sensor onboard EO-1; it was acquired on 4 June 2013 and composed of bands 2,1,3 (RGB). The image was obtained at a spatial resolution of 30 m per pixel. The north arrow and scale are approximate. Courtesy of Ashley Davies, NASA Jet Propulsion Laboratory. An overflight of Copahue's summit was conducted on 9 June by OVDAS-SERNAGEOMIN in order to make observations of the area as reconnaissance for future installations of three seismometers. A 200 m plume was visible rising from the crater although no lava or lava dome was visible within the crater. There were sulfurous gas odors and the observers also noted that there were no indications of lahar flows outside of the crater. On 23 and 26 August SERNAGEOMIN reported that incandescence was observed by the local webcamera; a possible ash event occurred on 26 June. Elevated SO2 emissions were also detected by the Ozone Monitoring Instrument (OMI) on 23 August and during 5 days in September. Incandescence was reported during the last week of September. On 16, 23, and 28 October, ash was observed by the local webcameras; the most energetic event occurred on 28 October. Elevated SO2 was detected by OMI on during 21, 26, and 27 October. SERNAGEOMIN reported in their November report that INSAR data from NASA determined that deformation of the edifice continued at a rate of 3.9 cm/year which was considered less than values measured earlier in the year. Incandescence was notable on 13 November and minor ash was reported on 16, 17, 18, 21, and 30 November. Elevated SO2was detected by OMI on 29 November. Small explosions were recorded on 10 December but ash was not confirmed. The local webcamera captured a plume that reached ~1,100 m above the crater. This event was accompanied by low-frequency seismicity. MODVOLC Alerts 2012-2013: Elevated temperatures were detected by the MODIS sensors onboard the Aqua and Terra satellites during 2012-2013 (table 1). The MODVOLC system generated alerts on 11 days during the two years of unrest. During 2013, the alerts occurred in January and May on two separate days. While the local, SERNAGEOMIN webcamera recorded incandescence (particularly at night), the satellite remote sensing capabilities contended with cloudcover that frequently masked the area. For example, in January 2013 alone, there were 4 notable cases of nighttime incandescence (on 5, 8, 9, and 11 January). Table 1. The MODVOLC system generated several thermal alerts during January 2012-May 2013. No additional alerts were generated during June-December 2013. Courtesy of HIGP. References. Agusto, M. 2011. Estudio Geoquímico de Fluidos Volcánicos-Hidrotermales del complejo volcánico Copahue-Caviahue, y su Aplicación a Tareas de Seguimiento. Tesis de Doctorado. 296 páginas. Facultad de Cs. Exactas y Naturales. Universidad de Buenos Aires. Agusto, M., Tassi, F., Capaccioni, B., Rouwet, D., Caselli. A., Vaselli, O. (en preparación). Chemical and isotopic compositions of fumarolic discharges from magmatic-hydrothermal system of Copahue volcano (Argentina). A combined (inorganic and organic) geochemical approach to understanding the origin of the fluid discharges. Agusto, M., Caselli, A., Tassi, F., dos Santos Afonso, M., Vaselli. O. 2012. (aceptado). Caracterización y seguimiento geoquímico de las aguas Ácidas del sistema volcÁn Copahue - río Agrio: posible aplicación para la identificación de precursores eruptivos. Revista de la Asociación Geológica Argentina. ISSN 0004-4822. Agusto, M., Vélez, ML., Caselli, A., Euillades, P., Tassi, F., Capaccioni, B., Vaselli, O. 2012. Correlación entre anomalías térmicas, geoquímicas y procesos deflacionarios en el volcán Copahue. XIII Congreso Geológico Chileno. Antofagasta, 2012. Actas: 429-431. Caselli, A.T., Agusto M.R. y Fazio A., 2005. Cambios térmicos y geoquímicos del lago cratérico del volcán Copahue (Neuquén): posibles variaciones cíclicas del sistema volcánico. XVI Congreso Geológico Argentino, La Plata. Actas I: 751-756. Caselli, A., Vélez, M.L., Agusto, M.R., Bengoa, C.L. Euillades, P.A. Ibañez, J.M., 2009. Copahue volcano (Argentina): A relationship between ground deformation, seismic activity and geochemical changes. Ed. Bean, Braiden, Lockmer, Martini and O'Brien.The VOLUME project.VOLcanoes: Understanding subsurface mass movement. Printed by jaycee. ISBN: 978-1-905254-39-2, pp 309-318. Caselli, A., M. Agusto, B. Capaccioni, F. Tassi, G. Chiodini y D. Tardani. 2012. Aumento térmico y composicional de las aguas cratéricas del VolcÁn Copahue registradas durante el año 2012 (Neuquen, Argentina). XIII Congreso Geológico Chileno. Antofagasta, 2012. Actas: 435-436. Forte, P., C. Bengoa, A. Caselli. 2012. AnÁlisis preliminar de la actividad sísmica del complejo volcÁnico Copahue-Caviahue mediante técnicas de array. XIII Congreso Geológico Chileno. Antofagasta, 2012. Actas: 568-570. Ibañez J. M., Del Pezzo E., Bengoa, C., Caselli, A.T., Badi, G.A y J. Almendros. 2008. Volcanic tremor associated with the geothermal activity of Copahue volcano, Southern Andes region, Argentina. Journal of Volcanology and Geothermal Research (Elsevier, ISSN:0377-0273) 174: 284-294. Tassi, F., Caselli, A., Vaselli, O., Agusto, M., Capecchiacci. F., 2007.Downstream composition of acidic volcanic waters discharged from Copahue crater lake (Argentina): the chemical evolution of Rio Agrio watershed. Federazione Italiana della Scienze della Tierra- FIST. Italia. Varekamp, J.C., Ouimette, A.; HermÁn, S., Bermúdez, A.; Delpino, D., 2001. Hydrothermal element fluxes from Copahue, Argentina: A "beehive" volcano in turmoil. Geology, 29 (11): 1059-1062. Varekamp, J.C., Ouimette, A.P., Herman, S.W., Flynn, K.S., Bermudez, A., Delpino, D., 2009. Naturally acid waters from Copahue volcano, Argentina. Applied Geochemistry 24, 208-220. Vélez, M.L., 2011. Análisis de la deformación asociada al comportamiento de sistemas volcÁnicos activos: Volcán Copahue. Tesis Doctoral. Facultad Ciencias Exactas y Naturales - Universidad de Buenos Aires, 154 p.
Velez, M. L., Euillades, P., Caselli, A., Blanco, M., Díaz, J.M., 2011, Deformation of Copahue volcano: Inversion of InSAR data using a genetic algorithm, Journal of Volcanology and Geothermal Research, 202: 117-126. Information Contacts: Observatorio Volcanológico de los Andes del Sur-Servicio Nacional de Geologia y Mineria (OVDAS-SERNAGEOMIN), Avda Sta María No. 0104, Santiago, Chile (URL: http://www.sernageomin.cl/); Alberto Caselli and Laura Vélez, Grupo de Estudio y Seguimiento de Volcanes Activos (GESVA), Departamento Ciencias Geológicas, FCE y N, Universidad de Buenos Aires, Buenos Aires , Argentina (URL: http://www.gesva.gl.fcen.uba.ar/); D. Pablo Groeber (UBA-CONICET), FCEyN - UBA (URL: http://www.ifibyne.fcen.uba.ar/new/); G. Badi, Departamento de Sismología e I. M., Facultad de Ciencias Astronómicas y Geofísicas, Universidad Nacional de La Plata (URL: http://www.fcaglp.unlp.edu.ar/ciencia-y-tecnica/); R. Daga, Laboratorio AnÁlisis por Activación Neutrónica (CAB-CNEA) - CONICET y C. Cotaro, y C. Ayala, Grupo de Caracterización de materiales (CAB-CNEA) (URL: http://www2.cab.cnea.gov.ar/); P. Euillades, L. Euillades, M. Blanco, and S. Balbarani, Instituto CEDIAC - Facultad de Ingeniería Universidad Nacional de Cuyo (URL: https://fing.uncu.edu.ar/); M. Araujo, Instituto Nacional de Prevención Sísmica (INPRES) (URL: http://www.inpres.gov.ar/); Buenos Aires Volcanic Ash Advisory Center (VAAC) (URL: http://www.smn.gov.ar/vaac/buenosaires/productos.php); Hawai'i Institute of Geophysics and Planetology (HIGP) MODVOLC Thermal Alerts System, School of Ocean and Earth Science and Technology (SOEST), Univ. of Hawai'i, 2525 Correa Road, Honolulu, HI 96822, USA (URL: http://modis.higp.hawaii.edu/); Simon Carn, NASA Global Sulfur Dioxide Monitoring, Aura/OMI (URL: https://so2.gsfc.nasa.gov/); La Nación, Buenos Aires, Argentina (URL: http://www.lanacion.com.ar/1539643-entro-en-erupcion-el-volcan-copahue); Dia a Dia, Buenoes Aires, Argentina (URL: http://www.diaadia.com.ar). After 12 years of passive degassing, Copahue became more active in 2012-2013 with an increase in seismicity, minor ash explosions (of which at least some were phreatic or phreatomagmatic), and increased fumarolic activity from the crater lake (BGVN 38:09). Except where otherwise noted, observations were provided by the Observatorio Volcanológico de los Andes del Sur-Servicio Nacional de Geologia y Mineria (OVDAS-SERNAGEOMIN); the Buenos Aires Volcanic Ash Advisory Center (VAAC) also provided frequent reports of ash plumes. This report covers the period from January 2014 to January 2016. Small explosions were recorded on 10 December 2013, the final activity of an eruption that began in December 2012; the volcano was quiet in subsequent months. Seismic unrest and elevated sulfur dioxide emissions began again in March 2014. A phreatic explosion on 4 July was followed by earthquake swarms and eventually significant ash explosions during 6 October-2 December 2014. Eruptive activity resumed around 20 September 2015 and was continuing as of late January 2016. Activity during March-December 2014. A gradual increase of volcanic tremor was detected starting at 0230 on 20 March 2014; from 0230 to 1100 the signal fluctuated and intense periods lasted up to 3 hours. Cameras showed minimal surface activity, while SO2 concentrations increased. The Alert Level was raised to Orange (second highest level), and residents and visitors were prohibited within a 3-km radius of the active crater. During 21-24 March, gas plumes rose as high as 500 m and drifted E. Seismicity continued to increase. Cameras installed around the volcano recorded white gas plumes rising 100-600 m above the crater during 25-29 March; clouds prevented observations on 30 March. SO2 measurements in metric tons per day (t/d) were 270 on 26 March, 1,400 on 27 March, 2,000 on 28 March, 1,400 on 29 March, and 920 on 30 March. On 4 April 2014 activity continued to fluctuate at an elevated level, but not at a level that would suggest an impending eruption; the Alert Level was lowered to Yellow. A phreatic explosion on 4 July deposited bombs (less than 12 cm in diameter), lapilli (less than 4 cm), ash, and gray clay smelling strongly of sulfuric acid along the E flank of the crater. During an overflight on 7 July, OVDAS-SERNAGEOMIN officials observed the deposit and measured a moderate amount of SO2 emissions (average 4,000 t/d), a relatively low water level in the crater, and low fumarole temperatures within El Agrio crater. DOAS stations had measured up to 18,000 t/d of SO2 on the day of the explosion. An anomalous tremor signal was detected at 0823 on 5 July that was associated with an explosion from the crater; a microphone installation 13 km E also detected an acoustic signal. The explosion generated a plume 1,000 m above the crater. On 14 September 2014 there was seismicity, with a seismic swarm of 389 long-period earthquakes; epicenters were within the crater area and hypocenters were at depths less than 3 km. Web cameras captured a persistent vapor plume that reached ~250 m above the crater and drifted ~700 m ENE. On 26 September a special volcanic activity report issued by OVDAS-SERNAGEOMIN noted a seismic swarm of 140 long-period events. Cameras recorded increased emissions; mostly white plumes with some ash rose 200-500 m and drifted SE. The report also noted that swarms had been recorded in late July and during 1-16 September. The Buenos Aires VAAC reported that during 6-7 October, satellite images detected diffuse steam-and-gas emissions with a small amount of ash that originated from near the summit. Two explosions from the crater on 11 October, reported by OVDAS-SERNAGEOMIN, generated dark gray ash plumes that rose as high as 3.6 km above the crater. Some minor explosions were detected after the second explosion. Incandescence in the vicinity of the crater was observed at night. The Alert Level was raised to Orange. Cameras recorded dark gray ash plumes rising to a maximum height of 1.9 km and drifting 35 km NE on 12 October, 2.2 km and drifting E on 13 October, and 0.4 km and drifting E on 14 October. Minor explosions continued to be detected. On 15 October gray ash plumes rose 300 m above the crater and four explosions were recorded. Plumes on 17 October were generally white and rose 100 m; no explosions were detected. Seismicity was low on 18 October. On 19 October, six explosions associated with ash emissions were recorded, plumes rose 300 m, and incandescence from the crater was seen in the evening. The network recorded 12 explosions with associated ash emissions the next day. During 20-21 October, plumes rose 200 m (figure 16), and crater incandescence at night was noted. Seismicity continued decreasing on 24 October, and emissions had become more diffuse with only minute amounts of tephra in some plumes. A small mud lake had also formed in the crater. The Alert Level was reduced to Yellow. Figure 16. Natural-color satellite image of Copahue showing a volcanic plume streaming SE from the volcano on 21 October 2014. Image was acquired by the Advanced Land Imager (ALI) on Earth Observing-1. Courtesy of NASA Earth Observatory. The Buenos Aires VAAC reported that during 15-16 November 2014, diffuse steam-and-gas emissions containing a small amount of ash were detected by the webcam. The VAAC reported that on 26 November diffuse steam-and-gas emissions, seen in webcam and satellite images, may have contained a small amount of ash. The plume rose to altitudes of 3.4-3.7 km and drifted 65 km E. On 30 November a pilot observation and webcam views revealed a diffuse and continuous plume near the summit. During 1-2 December a diffuse plume was detected in satellite images, while the webcam recorded continuous ash emissions. Activity during September 2015-January 2016. OVDAS-SERNAGEOMIN reported on 22 September 2015 that during the previous several days, web cameras had detected small explosions in the crater that dispersed incandescent material nearby. This activity, coupled with increased seismicity, increased SO2 emission levels, elevated emission temperatures, and partial loss of the crater lake, suggested a new eruption phase. On 6 October 2015 observers noted sporadic crater glow, indicative of small explosions in El Agrio Crater. A grayish plume rose 200 m above the crater and drifted SE. According to the Buenos Aires VAAC, a pilot observed a gray plume rising to altitudes of 6.1-7.6 km and drifting NE on 11 October. Satellite images indicated no ash; the webcam recorded continuous emissions of steam and gas, and low levels of ash. The next day the webcam recorded weak steam-and-gas emissions, possibly with minor amounts of ash drifting SE. The VAAC also reported that the webcam recorded weak emissions of steam, gas, and possibly minor amounts of ash during 16-18 October. Tremor amplitude began to oscillate on 19 November. On 20 November, crater incandescence coincided with small explosions that produced ash plumes. The Buenos Aires VAAC reported that, on 20 November, the webcam detected a continuous emission of steam and gas with minor amounts of ash; ash was not detected in satellite images. During 16-30 November continuous ash explosions at the crater were recorded by the webcam; plumes rose as high as 1.3 km above the crater on 29 November. Satellite images detected ash plumes drifting as far as 560 km SE and ESE. During an overflight on 28 November, scientists observed the absence of the crater lake and a growing pyroclastic cone. Impact craters from ballistics ejected during minor explosions were within a radius of 300 m of the crater. Based on satellite and webcam views, the Buenos Aires VAAC reported that during 18-20 December, steam and gas emissions with minor amounts of ash rose to altitudes of 3-3.6 km. Plumes drifted N on 18 December and 55-150 km SSE and SE on 19 December. During 20-22 December the webcam recorded continuous ash emissions drifting short distances. Diffuse ash plumes on 24-25, 27, and 29 December rose to altitudes of 3-3.6 km and drifted SE. On 30 December, diffuse gas and steam plumes possibly containing ash drifted SSE. The next day ash emissions drifted SW.
Based on satellite and webcam views, the Buenos Aires VAAC reported that on 6 January 2016 a gas and steam plume with minor amounts of ash rose to an altitude of 4.6 km. On 13 and 16 January, continuous gas-and-steam plumes containing minor amounts of ash drifted SE. During 20-23 January, almost continuous steam plumes containing minor amounts of ash drifted as far as 150 km W, S, SE, and E. During 28 January-2 February, almost continuous steam plumes containing minor amounts of ash rose to altitudes of 3-3.6 km and drifted as far as 160 km SE and SW. The Alert Level remained at Yellow. The only MODIS/MODVOLC thermal anomalies during the reporting period were on 25 December 2015 (1 pixel), 30 December 2015 (2 pixels), and 31 December 2015 (1 pixel). The MIROVA (Middle InfraRed Observation of Volcanic Activity) volcano hotspot detection system, also based on analysis of MODIS data, detected one hotspot within 5 km of the volcano during the last week of April 2015 and numerous hotspots within 5 km from the middle of October through January 2016; the radiative power of the anomalies were all in the low or moderate range. Recent activity at Copahue through January 2016 (BGVN 41:03) consisted of gas and steam plumes with minor amounts of ash. This report, based on information obtained from the Buenos Aires Volcanic Ash Advisory Center (VAAC), the Southern Andes Volcanological Observatory (OVDAS), and the Servicio Nacional de Geología y Minería (National Geology and Mining Service) (SERNAGEOMIN), covers similar activity from mid-January through December 2016. Volcano Alert Levels were maintained by SERNAGEOMIN (on a four-color scale) and by the Chilean Oficina Nacional de Emergencia del Ministerio del Interior (National Office of Emergency of the Interior Ministry) (ONEMI), on a three-color scale), for alerts to individual communes in the region. Reports from the Buenos Aires VAAC between 13 January and 26 March 2016, based on Significant Meteorological Information (SIGMET) notices, satellites, and webcam views, indicated continuous gas-and-steam plumes containing minor amounts of ash. The plumes rose as high as 3.3-4.3 km altitude (during 24-25 and 28 February) and drifted as far as 160 km (trending SE and SW) between 28 January and 2 February, and more generally as far as 150 km in a variety of directions. The Buenos Aires VAAC next reported steam-and-gas emissions, possibly containing minor amounts of ash on 11 June, based on webcam recordings. OVDAS-SERNAGEOMIN reported an eruption during 16-30 June characterized by phreato-magmatic explosions and Strombolian activity. During an overflight on 3 July, SERNAGEOMIN scientists observed Strombolian activity from a pyroclastic cone that was forming on the floor of El Agrio crater (figure 17). Figure 17. Photo taken during an overflight of Copahue on 3 July 2016 showing Strombolian activity from a pyroclastic cone on the floor of El Agrio crater. Courtesy of SERNAGEOMIN. Based on webcam and satellite views, the Buenos Aires VAAC reported that during 7-8 July diffuse gas-and-steam plumes with minor amounts of ash rose to an altitude of 3 km and drifted E and SE. The Alert Level remained at Yellow (second highest level on a four-color scale). Activity renewed in September and lasted through December 2016. Based on satellite and webcam images, notices from the Buenos Aires VAAC after 23 September described gas and water vapor plumes with minor ash content rising above the summit. The plumes rose as high as 5.2 km a.s.l. (during 23-25 and 27-29 November) and drifted based on wind direction SW, S, SSE, ESE, SE, E, ENE, NE, and N. On 2 December OVDAS-SERNAGEOMIN reported that activity continued to be dominated by weak Strombolian explosions, likely from a pyroclastic cone forming on the floor of El Agrio crater. The last VAAC reports of activity during 2016 were for gas-and-ash emissions to altitudes of 3.6-3.9 km drifting in S and E directions. The only MODVOLC thermal anomaly during the entire reporting period was on 26 October 2016 (1 pixel). 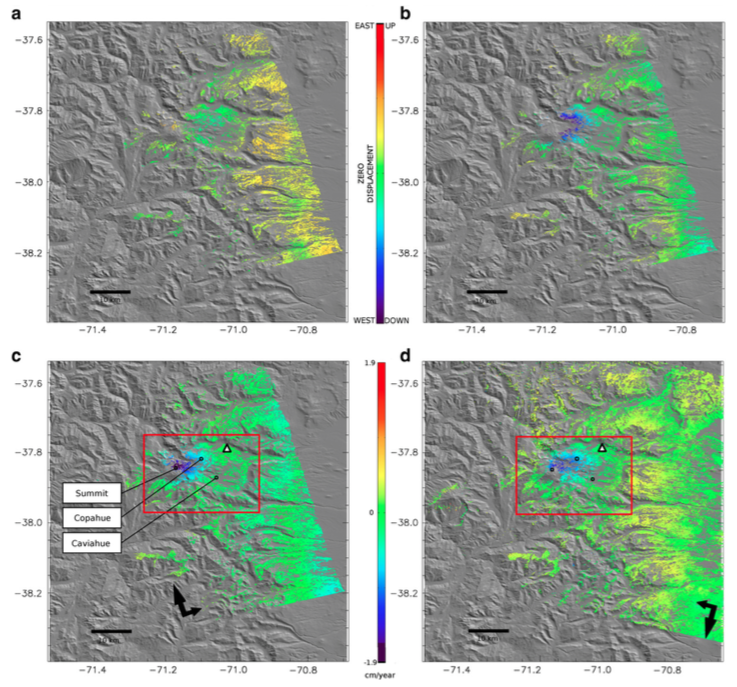 The MIROVA volcano hotspot detection system, also based on analysis of MODIS data, detected low level thermal anomalies that became more frequent during the latter part of June through early July 2016 and thereafter occurred less often. The last anomalies recorded by MIROVA (as of early April 2017) were in about the third week of December 2016 (figure 18). Figure 18. Plot of thermal anomalies at Copahue as recorded by the MIROVA system (Log Radiative Power), April 2016-March 2017. Courtesy of MIROVA. At some point after the December 2016 activity, SERNAGEOMIN lowered the Alert Level to Green, the lowest of the four levels. No additional reports of activity were issued from any agency through March 2017. Information Contacts: Servicio Nacional de Geología y Minería, (SERNAGEOMIN), Observatorio Volcanológico de Los Andes del Sur (OVDAS), Avda Sta María No. 0104, Santiago, Chile ( URL: http://www.sernageomin.cl/); Oficina Nacional de Emergencia - Ministerio del Interior (ONEMI), Beaucheff 1637/1671, Santiago, Chile (URL: http://www.onemi.cl/); Buenos Aires Volcanic Ash Advisory Center (VAAC), Servicio Meteorológico Nacional-Fuerza Aérea Argentina, 25 de mayo 658, Buenos Aires, Argentina (URL: http://www.smn.gov.ar/vaac/buenosaires/inicio.php?lang=es); Hawai'i Institute of Geophysics and Planetology (HIGP), MODVOLC Thermal Alerts System, School of Ocean and Earth Science and Technology (SOEST), Univ. of Hawai'i, 2525 Correa Road, Honolulu, HI 96822, USA (URL: http://modis.higp.hawaii.edu/); MIROVA (Middle InfraRed Observation of Volcanic Activity), a collaborative project between the Universities of Turin and Florence (Italy) supported by the Centre for Volcanic Risk of the Italian Civil Protection Department (URL: http://www.mirovaweb.it/). Recent activity at Copahue through December 2016 consisted of gas and steam plumes with minor amounts of ash. Eruptive activity ended in late December 2016, but ash emissions began again in early June 2017. Distinct ash emissions decreased after July, and crater incandescence was no longer reported. However, persistent tremor and degassing with sporadic ash continued through 2017. This report through December 2017 is based on information obtained from the Buenos Aires Volcanic Ash Advisory Center (VAAC), the Southern Andes Volcanological Observatory (OVDAS), and the Servicio Nacional de Geología y Minería (National Geology and Mining Service) (SERNAGEOMIN). Volcano Alert Levels are set by SERNAGEOMIN (on a four-color scale) and by the Chilean Oficina Nacional de Emergencia del Ministerio del Interior (National Office of Emergency of the Interior Ministry) (ONEMI), on a three-color scale), for alerts to individual communities in the region. OVDAS-SERNAGEOMIN reported that webcams recorded an increase in ash emissions on 4 June 2017. There were no significant changes in the magnitude or number of earthquakes recorded by the seismic network. The report noted that due to inclement weather making visual observations difficult, the observatory did not know if the ash emission began in the early hours of 4 June, or the day before. On the same day, OVDAS-SERNAGEOMIN raised the Alert Level to Yellow; ONEMI set a Yellow Alert for the communities of Villarrica, Pucón, and Curarrehue in La Araucanía, and for Panguipulli in Los Ríos. During 5-15 June 2017 the seismic network detected long-period earthquakes. Gas plumes constantly rose from El Agrio crater and on several days contained ash. The highest plume, detected on 5 June, rose 300 m and drifted E.
The Buenos Aires VAAC reported that on 1 July the webcam recorded a steam-and-gas plume with minor ash near the summit. Webcam and satellite images analyzed by the Buenos Aires VAAC showed that during 7-8 July steam plumes with minor amounts of ash rose to altitudes of 4-4.3 km altitude and drifted ESE. During 16-17 July similar plumes rose to altitudes of 3-3.4 km and drifted N and NW. According to ONEMI, OVDAS-SERNAGEOMIN reported that during 16-31 July surficial activity had decreased. The webcam recorded constant gas emissions with sporadic ash rising no more than 280 m from El Agrio crater. Crater incandescence was visible during clear weather. The Alert Level remained at Yellow, and SERNAGEOMIN recommended no entry closer than 1 km of the crater. ONEMI continued an Alert Level of Yellow for the municipality of Alto Biobío. In August, activity continued to decrease. Degassing was constant and sometimes contained ash. Plumes did not exceed 500 m in height and incandescence was absent. During the first half of the month, 23 seismic events occurred, 20 of which were volcanic-tectonic; tremor associated with the degassing was constant. During the latter half of August, SERNAGEOMIN lowered the Alert Level to Green. Because gas emissions continued, SERNAGEOMIN suggested that the public stay beyond a radius of 500 m of the active crater. SERNAGEOMIN reports for November and December indicated that some seismic activity continued. In November, 337 earthquakes occurred, 261 of which were volcanic-tectonic. Tremor associated with degassing continued, and incandescence was reported on some days. Based on satellite and webcam views, the Buenos Aires VAAC reported that during 21 and 24-27 November diffuse steam plumes containing minor amounts of ash rose and drifted E and NE. Plumes rose to altitudes of 3.3-3.6 km during 25-26 November. On 2 December, one volcanic-tectonic earthquake occurred at 1758 local time. More than 20 volcanic-tectonic earthquakes occurred about 2245 on 5 December. The SERNAGEOMIN report for December noted persistent tremor associated with gas and ash emissions, and that constant gas plumes with sporadic ash rising to a maximum height of 1,300 m above the summit was recorded by the web camera. The Alert Level remained Green through December 2017. Information Contacts: Servicio Nacional de Geología y Minería, (SERNAGEOMIN), Observatorio Volcanológico de Los Andes del Sur (OVDAS), Avda Sta María No. 0104, Santiago, Chile (URL: http://www.sernageomin.cl/); Oficina Nacional de Emergencia - Ministerio del Interior (ONEMI), Beaucheff 1637/1671, Santiago, Chile (URL: http://www.onemi.cl/); Buenos Aires Volcanic Ash Advisory Center (VAAC), Servicio Meteorológico Nacional-Fuerza Aérea Argentina, 25 de mayo 658, Buenos Aires, Argentina (URL: http://www.smn.gov.ar/vaac/buenosaires/). Volcán Copahue is an elongated composite cone constructed along the Chile-Argentina border within the 6.5 x 8.5 km wide Trapa-Trapa caldera that formed between 0.6 and 0.4 million years ago near the NW margin of the 20 x 15 km Pliocene Caviahue (Del Agrio) caldera. The eastern summit crater, part of a 2-km-long, ENE-WSW line of nine craters, contains a briny, acidic 300-m-wide crater lake (also referred to as El Agrio or Del Agrio) and displays intense fumarolic activity. Acidic hot springs occur below the eastern outlet of the crater lake, contributing to the acidity of the Río Agrio, and another geothermal zone is located within Caviahue caldera about 7 km NE of the summit. Infrequent mild-to-moderate explosive eruptions have been recorded since the 18th century. Twentieth-century eruptions from the crater lake have ejected pyroclastic rocks and chilled liquid sulfur fragments. Bruggen J, 1950. Fundamentals of the Geology of Chile. Santiago: Editado por el Instituto Geografico Militar, p 1-374. Casertano L, 1963. Chilean Continent. Catalog of Active Volcanoes of the World and Solfatara Fields, Rome: IAVCEI, 15: 1-55. Moreno H, 1974. Airplane flight over active volcanoes of central-south Chile. Internatl Symp Volc Andean & Antarctic Volc Problems Guidebook, Excur D-3, 56 p.
Moreno H, Naranjo J A, 1991. The southern Andes volcanoes (33°-41° 30' S), Chile. 6th Geol Cong Chile, Excur PC-3, 26 p.
Varekamp J C, Maarten deMoor J, Merrill M D, Colvin A S, Goss A R, Vroon P Z, Hilton D R, 2006. Geochemistry and isotopic characteristics of the Caviahue-Copahue volcanic complex, province of Neuquen, Argentina. In: Kay S M, Ramos V A (eds) Evolution of an Andean margin: a tectonic and magmatic view from the Andes to the Neuquen Basin (35°-39° S lat), Geol Soc Amer Spec Pap, 407: 317-342. Varekamp J C, Ouimette A P, Herman S W, Bermudez A, Delpino D, 2001. Hydrothermal element fluxes from Copahue, Argentina: a "beehive" volcano in turmoil. Geology, 29: 1059-1062. There is data available for 18 Holocene eruptive periods. Remarks: Copahue volcano is subsiding at a rate of 2 cm/year centered on the NE flank of the volcano. Mean deformation velocities map (a) ascending pass (b) descending pass. White triangles show the location of the reference point where the deformation amount is zero. Red boxes limit the area where height versus displacement statistics were computed (Fig. 4). Deformation components (c) east?west direction and (d) vertical. From: Velez et al. 2011. Reference List: Fournier et al. 2010; Velez et al. 2011. Velez, M. L., Euillades, P., Caselli, A., Blanco, M., & Diaz, J. M., 2011. Deformation of Copahue volcano: inversion of InSAR data using a genetic algorithm. J. Volcanol. Geotherm. Res., 202(1), 117-126. Volcán Copahue is a composite volcano constructed along the Chile-Argentina border within an 8-km-wide Pleistocene caldera. The eastern summit crater, part of a 2-km-long, ENE-WSW line of nine craters, contains the briny El Agrio crater lake and displays intense fumarolic activity. Infrequent explosive eruptions have been recorded since the 18th century from the 2965-m-high volcano. Photo by Hugo Moreno (University of Chile). 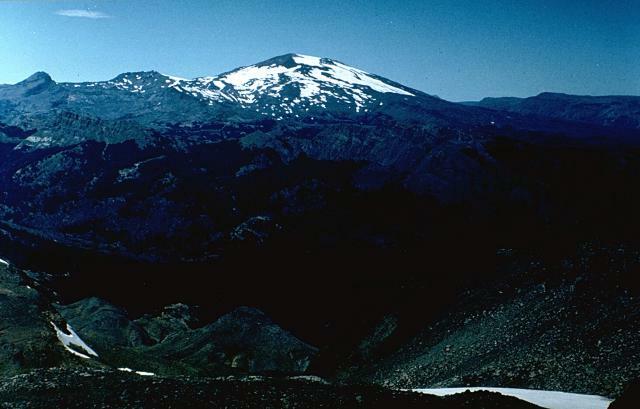 The broad glacier-covered summit of Volcán Copahue along the Chile/Argentina border is seen from the SE with conical Callaqui volcano in the distance. The lake-filled active crater of Copahue (lower center) has been the site of historical eruptions. The composite cone was constructed along the Chile/Argentina border within an 8-km-wide caldera formed 0.6 million years ago. The eastern summit crater is part of a 2-km-long, ENE-WSW line of nine craters that cuts across the western rim of the caldera. Photo by Oscar González-Ferrán, 1992 (University of Chile). There are no samples for Copahue in the Smithsonian's NMNH Department of Mineral Sciences Rock and Ore collection. Large Eruptions of Copahue Information about large Quaternary eruptions (VEI >= 4) is cataloged in the Large Magnitude Explosive Volcanic Eruptions (LaMEVE) database of the Volcano Global Risk Identification and Analysis Project (VOGRIPA).